Born in Liverpool, Ernest Wright Alexander was the son of Robert Alexander, a shipowner and director of the Suez Canal Company, and Annie Alexander (née Gregg), a Belfast lady. He was educated at Cherbourg House, Malvern, Harrow and Sandhurst. He received his first commission in July 1889. He served twice in India: from 1892 to 1900 and from 1903 to 1906, when he was promoted to major. In 1914 he was still a major (because promotion was painfully slow in the peace-time army) and serving with the 119th Battery of the Royal Field Artillery. British troops first encountered the German Army at Mons on 22 August and Alexander won his VC two days later. On 24 August 1914, during the retreat from Mons at Elouges, Belgium, when the flank guard was attacked by a German corps, Alexander handled his battery against overwhelming odds with such conspicuous success that all his guns were saved notwithstanding that they had to be withdrawn by hand by himself and volunteers led by a Captain Grenfell of the 9th Lancers, who also received the VC for his part in rescuing the guns. This enabled the retirement of the 5th Division to be carried out without serious loss. Subsequently, Major Alexander rescued a wounded man under heavy fire. Alexander’s courage and leadership resulted in a series of rapid promotions, culminating in his command of the Royal Artillery of XI Corps from May 1917 to April 1918 and the rank of major general. During the course of the war Alexander was mentioned nine times in dispatches. Alexander’s VC is on display at the Ashcroft Gallery in the Imperial War Museum in London. One of the earliest VCs of the Great War was won by a Monaghan man – Sergeant David Nelson of ‘L’ Battery, Royal Horse Artillery – at Néry, a small village in the département of Oise, near Compiègne. David Nelson was the eldest son of George and Annie Nelson, Stranooden, Monaghan. A regular soldier, Nelson had enlisted in the Royal Field Artillery in 1904. He subsequently transferred to the Royal Horse Artillery. He was promoted to bombardier with ‘L’ Battery on 3 April 1910 and to sergeant on 5 August 1914 (the day after Britain declared war on Germany), having obtained a first-class gunnery certificate from the School of Gunnery at Shoeburyness. After a fierce battle with the Germans at Néry reinforcements arrived which were able to eject the Germans from their commanding position. During the course of the action 45 officers and men from Nelson's ‘L’ Battery were either killed or wounded. Hospitalised after the action at Néry and taken prisoner by the Germans two days later, Nelson managed to escape after a few days in captivity and rejoin the BEF (the British Expeditionary Force). For helping to bring the guns into action under heavy fire at Néry, on 1st September, 1914, Nelson was awarded the VC. However, while commanding ‘D’ Battery, 59th Brigade, Royal Field Artillery, he was wounded on 7 April 1918. He died of his wounds on the following day and is buried in Lillers Communal Cemetery, France. Sergeant Nelson’s VC is in the Imperial War Museum in London. The Brookes of Colebrooke in County Fermanagh are an Ulster family with a remarkable record of military service. 53 Brookes served in the Great and Second World Wars with 12 of them dying in action. The family also provided the United Kingdom with Alan Brooke, 1st Viscount Alanbrooke, its ‘Master of Strategy’ (as his statue in Whitehall describes him) and Chief of the Imperial General Staff for the greater part of the Second World War. Although born in Aberdeen, James Anson Otho Brooke was the grandson of Sir Arthur Brinsley Brooke, the second Baronet of Colebrooke, and the son of Sir Harry Vesey Brooke and Patricia Moir-Byres. 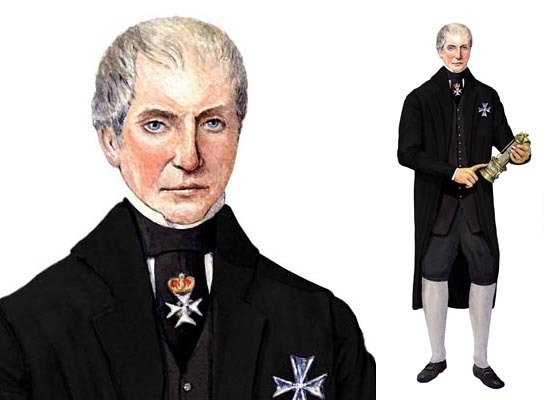 He was educated at Wellington and at Sandhurst where he had won the Sword of Honour. He was also a fine sportsman. 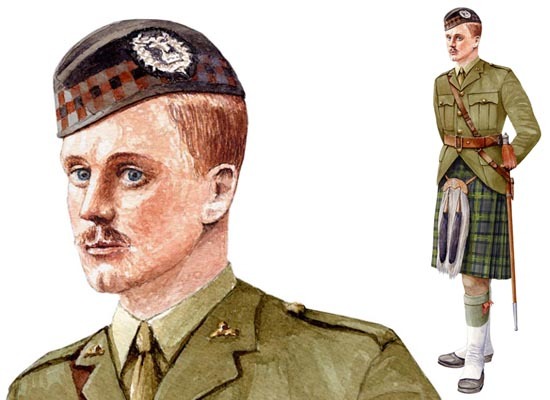 When he won his VC during the First Battle of Ypres, he was a 30-year-old lieutenant in the 2nd Battalion, Gordon Highlanders, his father’s old regiment. 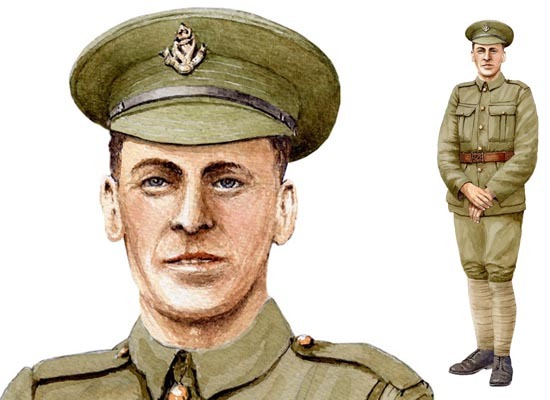 On 29 October 1914 near Gheluvelt, Belgium, Lieutenant Brooke led two attacks on the German trenches under heavy rifle and machine-gun fire, regaining a lost trench at a very critical moment. 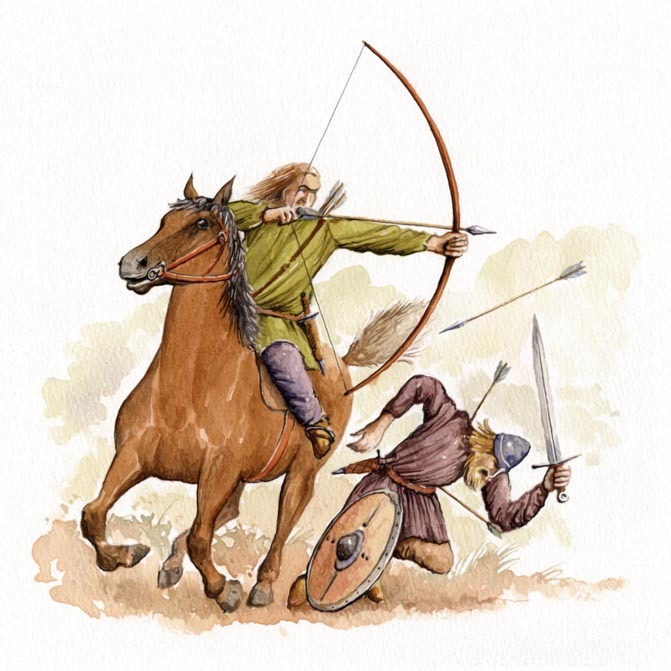 By his marked coolness and promptitude on this occasion, Lieutenant Brooke prevented the enemy from breaking through the British line at a time when a general counter-attack could not have been organised. Having regained the lost trench, he went back to bring up support, and while doing so, was killed. 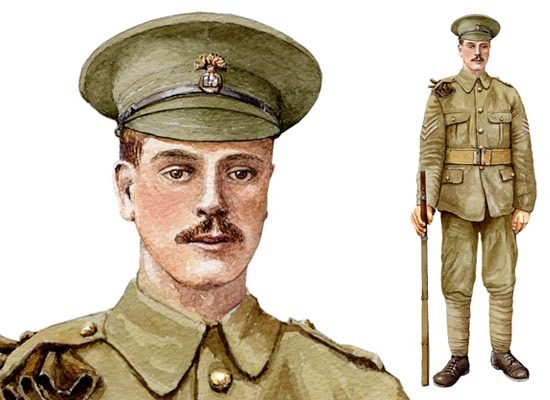 Lieutenant Brooke was posthumously promoted to captain, effective from September 1914. He is interred at Zantvoorde British Cemetery, Zonnebeke, Belgium. There is a memorial to him at Springbank Cemetery, Aberdeen, and another attached to a captured German field gun at the Inniskillings’ Regimental Museum in Enniskillen. Robert Morrow, the son of Hugh and Margaret Morrow, was born and raised on a farm near Newmills, Dungannon, County Tyrone. He was 23 years old when he won his VC and a private in the 1st Battalion, Royal Irish Fusiliers. Marcus Cunliffe, the historian of the Royal Irish Fusiliers, has described him as ‘a quiet, undemonstrative boy’. He was also small in stature. Nevertheless, on 12 April 1915 near Messines, Belgium, Private Morrow rescued and carried to places of comparative safety several men who had been buried in the debris of trenches wrecked by shell fire. He carried out this work on his own initiative and under heavy fire from the enemy. A fortnight later (on 26 April 1915) he was killed in action at St Jan in the Ypres Salient, Belgium. He is buried in White House Commonwealth War Graves Cemetery. King George V presented the VC to his mother at Buckingham Palace. His VC is displayed at the Royal Irish Fusiliers Museum in Armagh. Somers, the son of Robert and Charlotte Somers, was born in Belturbet, County Cavan. He first joined the Special Reserve of the Royal Munster Fusiliers on 14 January 1913. He joined the 2nd Battalion Inniskillings in July 1914, and later served in Belgium and France when war broke out, being severely wounded on the Retreat from Mons in August 1914. Having recovered from his wounds in England, he was ordered to join the 1st Battalion, and sailed off to Gallipoli. He was 31 years old, and a serjeant [sic] in the 1st Battalion, Royal Inniskilling Fusiliers when he won his VC there. 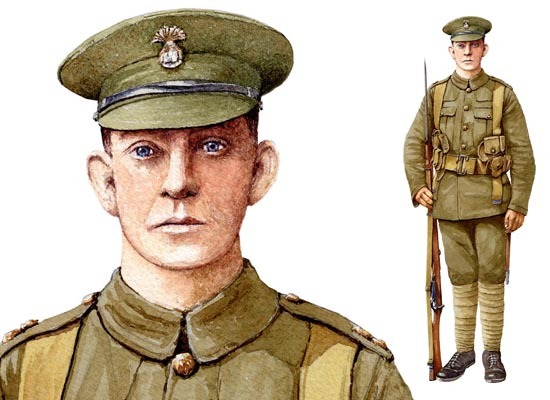 On 1-2 July 1915, when, owing to hostile bombing, some of his troops had retired from a sap, Serjeant Somers remained alone there until a party brought up bombs. He then climbed over into the Turkish trench and bombed the Turks with great effect. 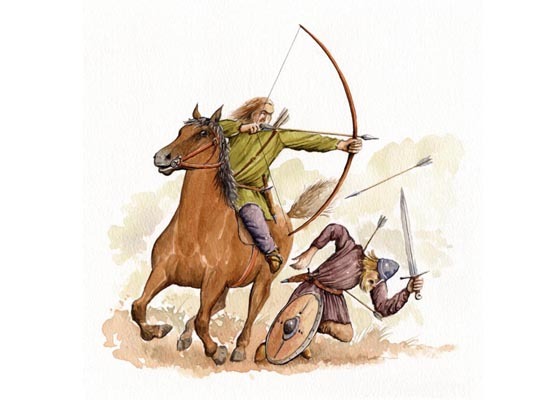 Later on, he advanced into the open under heavy fire and held back the enemy by throwing bombs into their flank until a barricade had been established. During this period, he frequently ran to and from his trenches to obtain fresh supplies of bombs. Born in Victoria, British Columbia, Canada, John Alexander Sinton was the third of the seven children of Ulster-Scots parents. Walter Lyon Sinton, his father, was of Quaker stock, while Isabella Mary (née Pringle), his mother, was a Presbyterian. On his mother’s side he was a cousin of James Pringle KC MP and a nephew of Thomas Sinton, the industrialist. 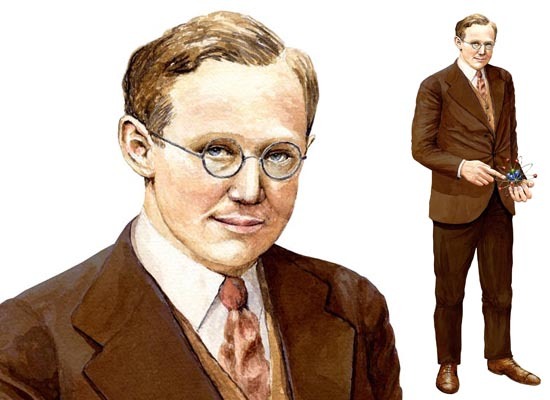 On his father’s side he was a cousin of Ernest Walton (who won the Nobel Prize for Physics in 1951 for his role in splitting the atom in 1932). The family returned to Ulster in 1890 and that remained Sinton’s base throughout his much travelled life. Academically gifted from an early age, he was first in the entrance examination for the Indian Medical Service (IMS) and was gazetted lieutenant IMS in July 1911. Sinton served with great distinction in the military branch of the IMS from 1912 to 1921, when he transferred to the civil branch in which he served until his retirement in 1936. 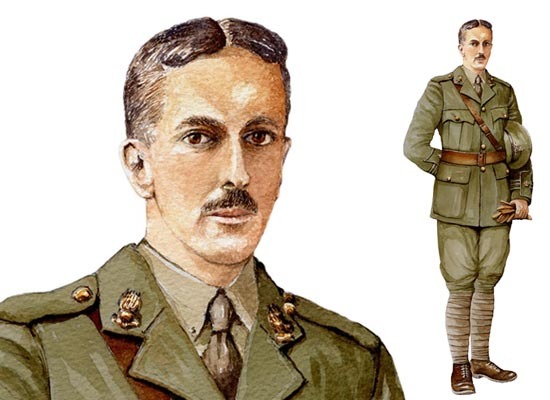 He served on the North-West Frontier, in Mesopotamia, Afghanistan, Waziristan, and Turkestan, and was decorated many times, receiving the VC in 1916, the OBE, and the Russian order of St George, and was mentioned in dispatches six times. 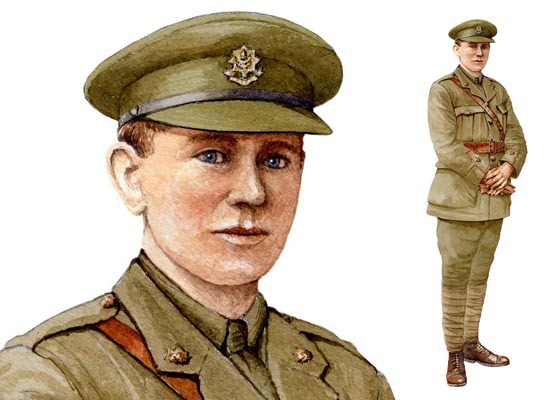 He was 31 years old and a captain in the IMS when he won the VC for attending to the wounded under very heavy fire at Orah Ruins, Mesopotamia, on 21 January 1916. Although shot through both arms and through the side, he refused to go to hospital, and remained as long as daylight lasted, attending to his duties under very heavy fire. At the time of his death in 1956, he was the only person entitled to place the letters VC FRS after his name. His Victoria Cross is displayed at the Army Medical Services Museum at Aldershot. A month before the beginning of the Battle of the Somme 150 ships of the British Grand Fleet, commanded by Admiral Jellicoe, confronted 100 ships of the German High Seas Fleet, commanded by Admiral Scheer, in the grey waters of the North Sea, making it the largest naval engagement of the Great War. As aircraft played no part in the battle and submarines played only a minimal role (although fear of them figured prominently in Admiral Jellicoe’s calculations), the Battle of Jutland is likely to remain the biggest and last purely surface encounter in naval history. During the battle Bingham was reported as having been killed but had, in fact, been picked up by a German destroyer. On sighting the enemy, the Bangor-born Bingham had ordered his own destroyer and HMS Nicator, to close to within 2,750 meters of the German battle fleet so that he could deploy his torpedoes. While mounting their attack Nestor and Nicator came under concerted fire and Nestor was subsequently sunk. 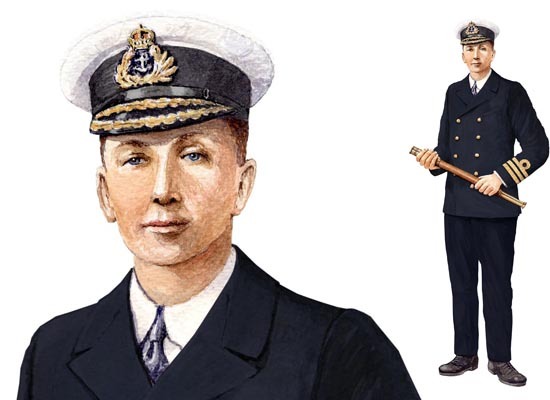 For his leadership and courage Bingham earned his VC, one of the comparatively few awarded for naval bravery during the Great War. After the Battle of Jutland (which was a tactical German victory but a strategic British one), Bingham spent the remainder of the war as a POW. After the war he resumed his career in the Royal Navy and retired as a rear admiral in 1932. Bingham’s VC was purchased by the North Down Borough Council in 1983 and is now on display at the North Down Museum, based in Bangor Castle, where Bingham was born and which was once his home. The great allied offensive on the Somme in which the 36th (Ulster) Division distinguished itself began at zero hour (7:30 am) on 1 July 1916. Even before the men of the Ulster Division went over the top that morning William Frederick McFadzean, the Young Citizen Volunteers’ most famous member, had performed a selfless and heroic act which was to win him a posthumous VC. 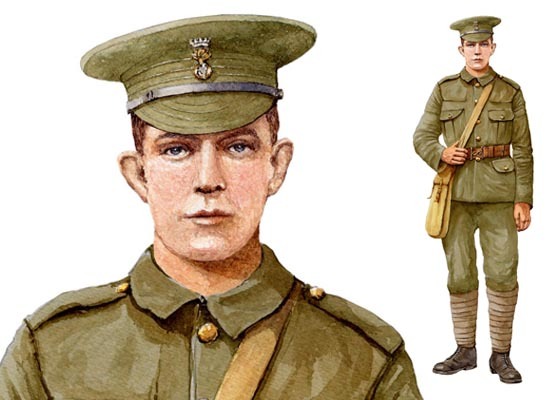 Standing six feet tall, McFadzean became a ‘grenadier’ or a ‘bomber’ in the battalion because of his height. On the morning of 1 July 1916 before ‘zero hour’ he was busily equipping himself to undertake his role as a ‘bomber’. The award of Private McFadzean’s VC was gazetted on 26 September 1916. The citation succinctly explains how he won his VC - "For most conspicuous bravery near Thiepval Wood, on 1st July, 1916. While in a concentration trench, and opening a box of bombs for distribution prior to an attack, the box slipped down into the trench, which was crowded with men, and two of the safety pins fell out. Private McFadzean, instantly realising the danger to his comrades, with heroic courage threw himself on top of the bombs. The bombs exploded, blowing him to pieces, but only one other man was injured. He well knew his danger, being himself a bomber, but without a moment’s hesitation he gave his life for his comrades." 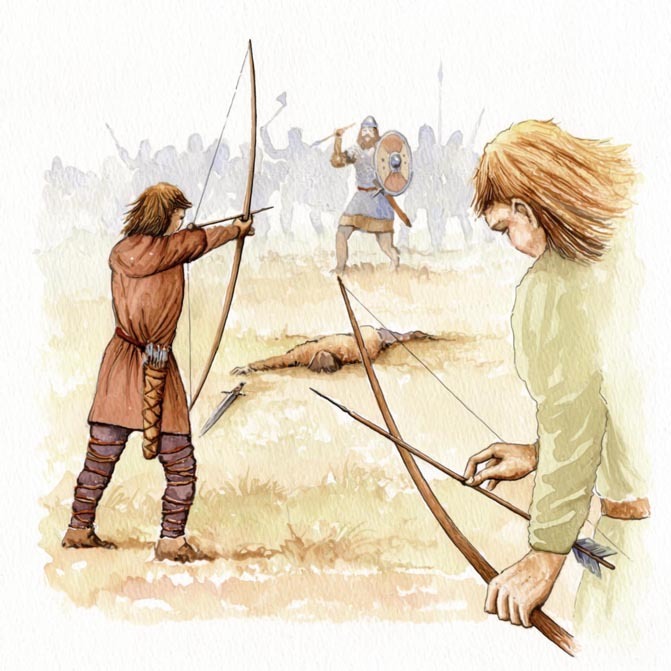 William’s comrades laid the body carefully aside, hoping that he would receive a decent burial later. However William has no known grave and is commemorated on the Thiepval Memorial to the Missing, Pier and Face 15A and 15B. King George V presented Private McFadzean’s VC to his father at Buckingham Palace on 28 February 1917. Eric Norman Frankland Bell was born at Alma Terrace in Enniskillen and was the son of Edward and Dora Bell. His mother came from Manorhamilton, County Leitrim, and his father from Budeaux, Devon. Bell had been living and working in Liverpool at the outbreak of the Great War but returned to Enniskillen to join the Royal Inniskilling Fusiliers. At the time of his award Captain Bell was attached to 109th Brigade’s Light Mortar Battery. Captain Bell’s VC was announced in the London Gazette of 26 September 1916. The citation read - "For most conspicuous bravery at Thiepval, on 1st July, 1916. He was in command of a trench mortar battery, and advanced with the infantry to the attack. When our front line was hung up by enfilading machine gun fire, Captain Bell crept forward and shot the machine gunner. Later on, no less than three occasions, when our bombing parties, which were clearing the enemies’ trenches, were unable to advance, he went forward alone and threw trench mortar bombs among the enemy. When he had no more bombs available he stood on the parapet, under intense fire, and used a rifle with great coolness and effect on the enemy advancing to counter-attack. Finally he was killed rallying and reorganizing infantry parties which had lost their officers. All this was outside the scope of his normal duties with his battery. He gave his life in his supreme devotion to duty." King George V presented Bell’s VC to Captain E.H. Bell on 29 November 1916. was donated to the Inniskillings’ Regimental Museum, Enniskillen, where it may now be seen. He is commemorated on the Thiepval Memorial to the Missing, Pier and Face 4D and 5B. Robert Quigg was born in Carnkirk, a townland about two miles from Bushmills, between that town and Ballintoy. Employed before the war on Macnaghten estate, he went to war as batman to Sir Harry Macnaghten, Baronet. Family tradition has it that Quigg was told by Sir Harry's mother Lady Macnaghten that he was not to return home without Sir Harry. If this is true, Lady Macnaghten’s stern injunction may offer a partial explanation of Quigg’s actions on 1-2 July 1916. 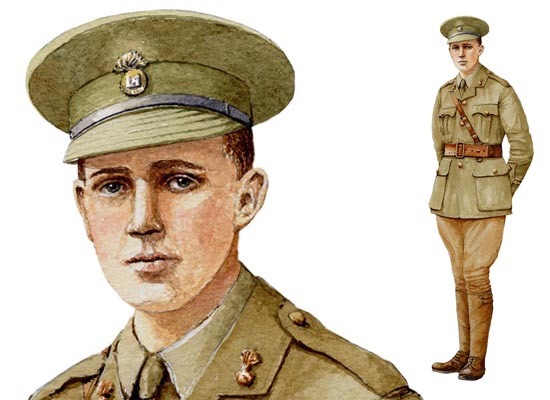 Quigg won his VC ‘for most conspicuous bravery’ at the Somme on 1-2 July 1916. According to the citation - "He advanced to the assault with his platoon three times. Early next morning, hearing a rumour that, his platoon officer [Sir Harry] was lying out wounded, he went out seven times to look for him under heavy shell and machine gun fire, each time bringing back a wounded man. The last man he dragged in on a water-proof sheet from within a few yards of the enemy’s wire. 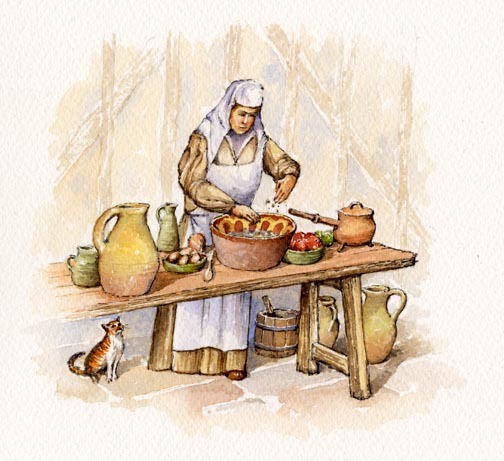 He was seven hours engaged in this most gallant work, and finally was so exhausted that he had to give it up." Sir Harry’s body was never found. Rifleman Quigg received his VC from King George V at Sandringham on 8 January 1917. It is said that when presenting the VC to Quigg, the King observed, ‘You’re a very brave man, Quigg.’ The gruff Ulsterman replied, ‘You’re a brave man yourself, King’. 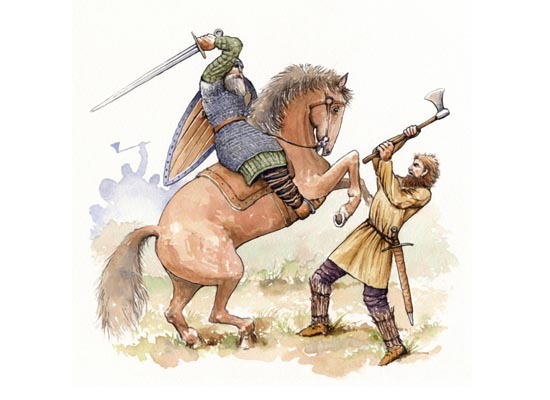 A possible explanation for the odd exchange is the different interpretation of the word 'brave' in English and Ulster-Scot! When Quigg returned to Bushmills he received a hero’s welcome and Lady Macnaghten presented him with a gold watch in recognition of his bravery. Geoffrey St. George Shillington Cather was born in Streatham Hill, London, of Ulster parents. Margaret, his mother, was a member of the prominent Portadown Shillington family, and Robert, his father, came from Coleraine. Although he grew up in England and was educated at Rugby, he spent his school holidays in Portadown. His education at Rugby was prematurely terminated by the death of his father in 1908. 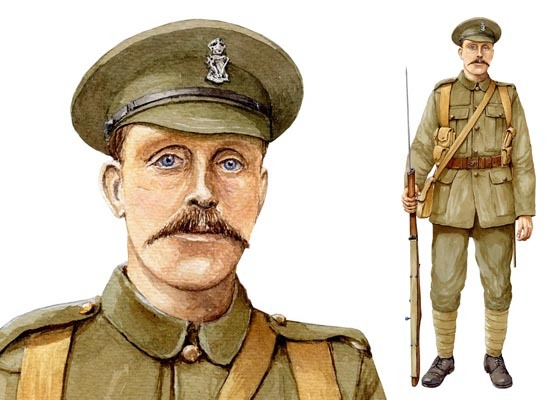 Cather enlisted in the Artists’ Rifles in 1914 and in May 1915 was commissioned into 9th Battalion, the Royal Irish Fusiliers. He went to France on 5 October. 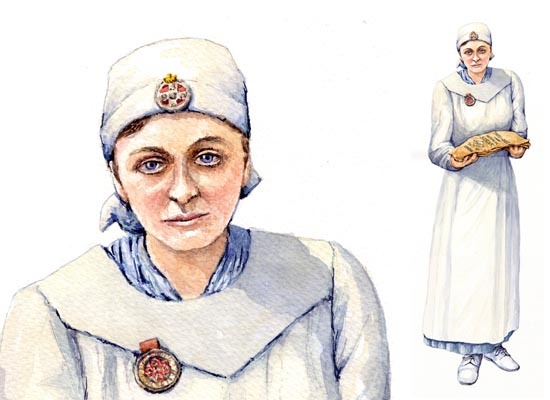 At the time of his award Lieutenant Cather was serving as battalion adjutant. Lieutenant Cather’s VC was announced in the London Gazette of 9 September 1916. The citation read - "For most conspicuous bravery near Hamel, France, on 1st July, 1916. 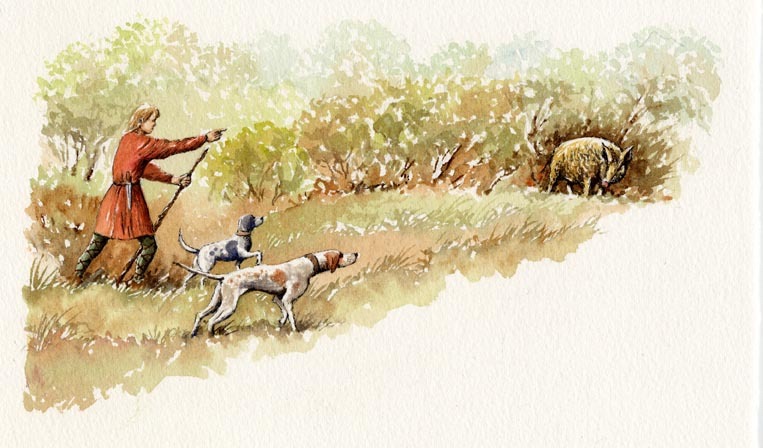 From 7 p.m. till midnight he searched “No Man’s Land,” and brought in three wounded men. Next morning, at 8 a.m., he continued his search, brought in another wounded man, and gave water to others, arranging for their rescue later. 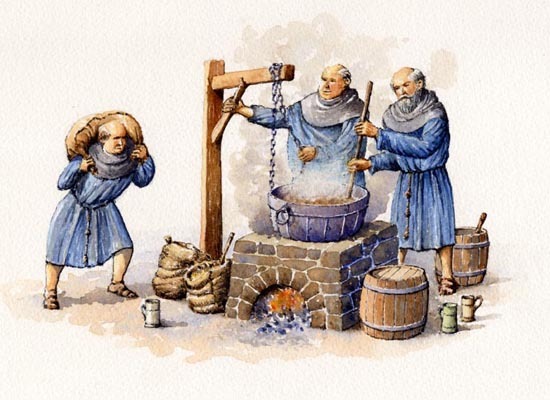 Finally, at 10-30 a.m., he took out water to another man, and was proceeding further on when he was himself killed. All this was carried out in full view of the enemy, and under direct machine gun fire and intermittent artillery fire. He set a splendid example of courage and self-sacrifice." King George V presented Lieutenant Cather’s VC to his widowed mother at Buckingham Palace on 31 March 1917. 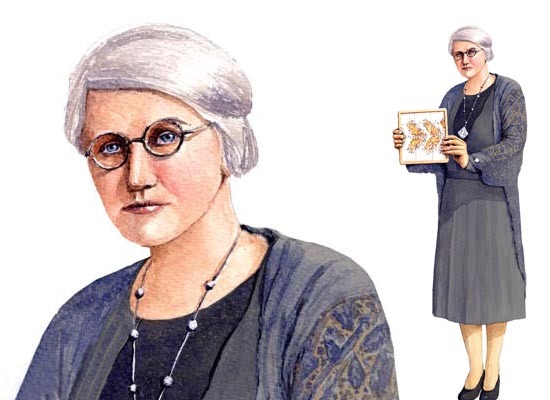 Lieutenant Cather is commemorated on the Thiepval Memorial to the Missing, Pier and Face 15A. His VC was presented in 1979 to the Royal Irish Fusiliers Regimental Museum, The Mall, Armagh, by Captain Dermot Cather RN (Retd), his brother. Thomas Hughes was born in Coravoo, near Castleblayney in County Monaghan, and was a private in the 6th Battalion of the Connaught Rangers when he won the VC at Guillemont on the Somme on 3 September 1916. Having been wounded in an attack, Hughes returned to the firing line after having his wounds dressed. Seeing a hostile machine gun, he dashed out in front of his company, shot the gunner and captured the gun as well as bringing back four German prisoners. Hughes received his VC from the King at an investiture in Hyde Park, London, on 2 June 1917. He also received the 1914-15 Star, British War Medal and Allied Victory Medal. Hughes later achieved the rank of corporal. He died in Carrickmacross, County Monaghan, and is buried in the cemetery attached to St Patrick’s Roman Catholic church in Broomfield, near Castleblayney. His VC is on display at the National Army Museum, Chelsea. Dunville was born at 46 Portland Place, Marylebone, London, to Colonel John Dunville CBE DL and Violet Anne Blanch Dunville (née Lambart). 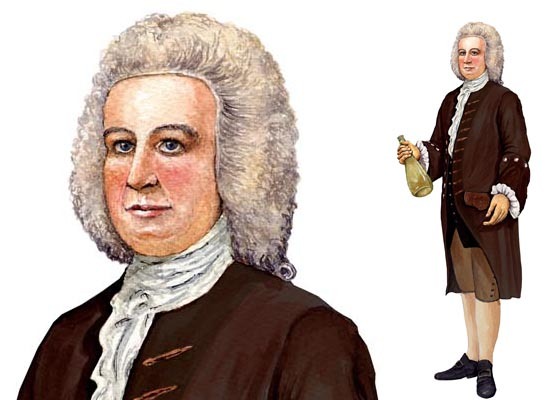 Colonel John Dunville came from Holywood, County Down, and was chairman of Dunville & Co whiskey distillers. 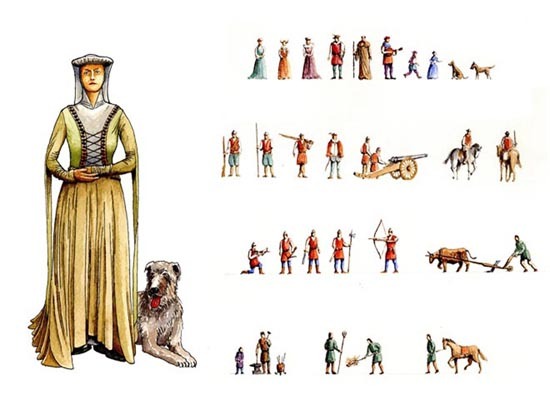 Dunville passed matriculation for Trinity College, Cambridge, but chose to join the army instead. 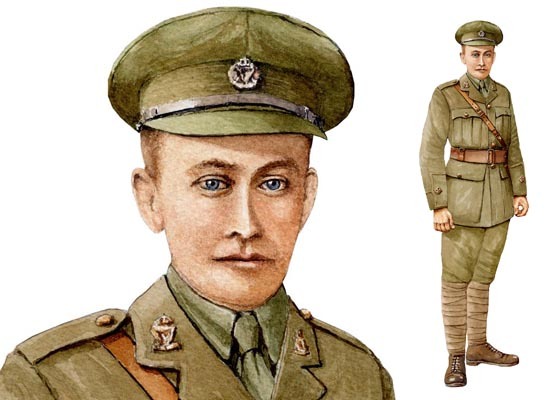 He was aged 21 and a second lieutenant in the 1st Royal Dragoons when he was awarded the VC for his actions on 24/25 June 1917 near Epehy, a village between Cambrai and Peronne in France. The citation in the London Gazette of 2 August 1917 reads as follows: "For most conspicuous bravery. When in charge of a party consisting of Scouts and Royal Engineers engaged in the demolition of the enemy’s wire, this officer displayed great gallantry and disregard of all personal danger. In order to ensure the absolute success of the work entrusted to him, 2nd Lt. Dunville placed himself between the N.C.O. of the Royal Engineers and the enemy’s fire, and thus protected, this N.C.O. was enabled to complete a work of great importance. 2nd Lt. Dunville, although severely wounded, continued to direct his men in the wire-cutting and general operations until the raid was successfully completed, thereby setting a magnificent example of courage, determination and devotion to duty, to all ranks under his command. This gallant officer has since succumbed to his wounds." Second Lieutenant John Spencer Dunville died of wounds the day after performing the deed, and is interred at the Villiers-Faucon Communal Cemetery, Somme, France, (Plot No. A21).His VC is on display at the Household Cavalry Museum, Windsor. Born at Aughnahoory, Kilkeel, County Down, Robert Hill Hanna was educated at the nearby Ballinran School. Aged 18, he emigrated to Canada, joining the Canadian Expeditionary Force in November 1914. Almost three years later, on 21 September 1917, as Company Sergeant-Major Hanna he won the VC. The official citation, published in the London Gazette of 8 November 1917, explains how he won his VC - "On the 21st August 1917, at Hill 70 Lens, France, Company Sergeant-Major Hanna’s company met with most severe enemy resistance at a heavily protected strong point, which had beaten off three assaults and all the officers of the company had become casualties. This warrant officer, under heavy machine-gun and rifle fire, coolly collected and led a party against the strong point, rushed through the wire and personally killed four of the enemy, capturing the position and silencing the machine-gun. This courageous action was responsible for the capture of a most important tactical point." After receiving his VC, Hanna, by now a lieutenant, visited Kilkeel (the first of a number of return visits to his home town) and received a rapturous reception at public meeting in the Square attended by upwards of 3,000 people. At the end of the war he returned to Vancouver where he ran a logging camp until 1938. In 1930 he married Hannah, a girl of Scottish parentage. They had two sons. He paraded with the Canadian contingent at the Victoria Cross Centenary Review held by H. M. the Queen in Hyde Park in London in 1956 and is buried at the Masonic Cemetery, Burnaby, British Columbia, but his officer’s sword is proudly on display in Kilkeel’s Royal British Legion Club. Although Hugh Colvin was born in Burnley, Lancashire, his family came from Ulster. 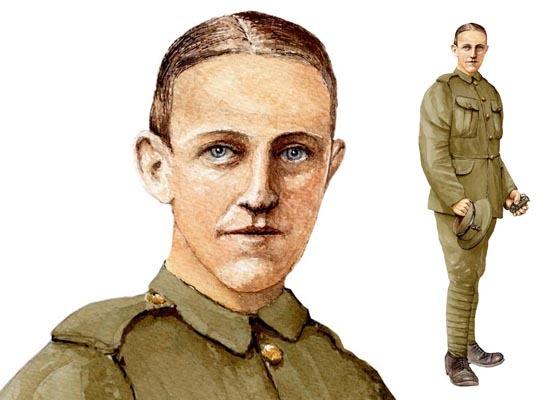 He was 30 years old and a second lieutenant in the 9th Battalion, Cheshire Regiment when he won the VC. 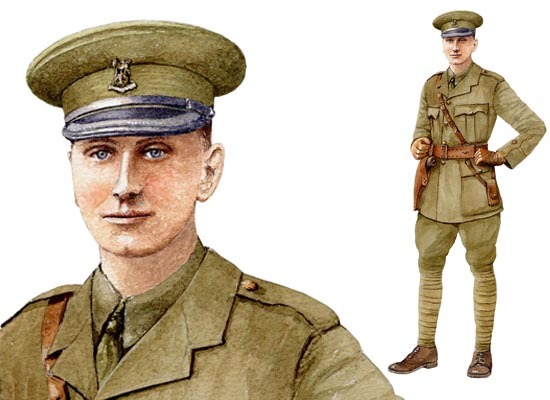 On 20 September 1917 east of Ypres, Belgium, when all the other officers of his company and all but one in the leading company had become casualties, Second Lieutenant Colvin took command of both companies and led them forward under heavy fire with great success. He went with only two men to a dug-out, when he left the men on top, entered it alone and brought out 14 prisoners. He then proceeded to clear other dug-outs, alone or with only one man, capturing machine-guns, killing some of the enemy and taking a large number of prisoners. He subsequently achieved the rank of major. Although he died in Chester, his sister, who lived in Bangor, County Down, had his remains brought to Belfast for burial in the family plot at Carnmoney. His VC is displayed at the Cheshire Regimental Museum, Chester. James Duffy, a private in the 6th Battalion, Royal Inniskilling Fusiliers, was born on 17 November 1889 in Gweedore, County Donegal. He was 28 years old when he won his VC in Palestine. On 27 December 1917 at Kereina Peak, whilst the company was holding a very exposed position, Private Duffy, a stretcher-bearer, and another stretcher-bearer went out to bring in a seriously wounded comrade. When the other stretcher-bearer was wounded, Private Duffy returned to get another man, who was killed almost immediately. The private then went forward alone and, under very heavy fire, succeeded in getting both wounded men under cover and attended to their injuries. His gallantry undoubtedly saved both men’s lives. He died in Drumany, Letterkenny, County Donegal, on 8 April 1969 and was buried in Conwal Cemetery, Letterkenny. His VC is displayed at the Inniskilling Museum, Enniskillen. Edmund De Wind was born in Comber, County Down, his father being the chief engineer of the Belfast and County Down Railway. 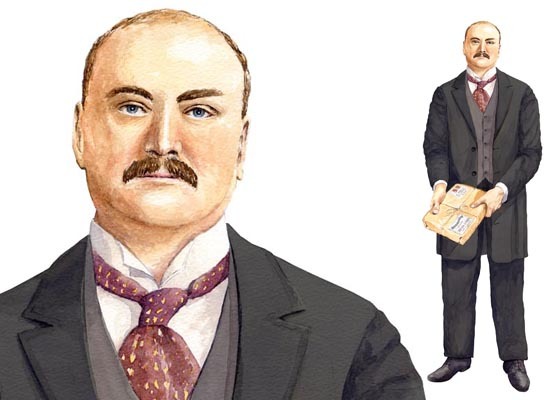 In 1910 he emigrated to Canada and there entered the employment of the Bank of Commerce until the outbreak of the Great War. He later earned a commission in September 1917, and was posted to the 15th Battalion, the Royal Irish Rifles (North Belfast Volunteers). Edmund won the VC for action during the Kaiserschlacht (the ‘Kaiser’s battle’ in English), the huge German spring offensive which began on 21 March 1918. Thirty-four year-old Second Lieutenant De Wind was one those who valiantly endeavoured to hold the Germans at bay against overwhelming odds. The award was announced in the London Gazette on of 13 May 1919 - "For most conspicuous bravery and self-sacrifice on the 21st March, 1918, at the Race Course Redoubt, near Grugies [southeast of St. Quentin]. 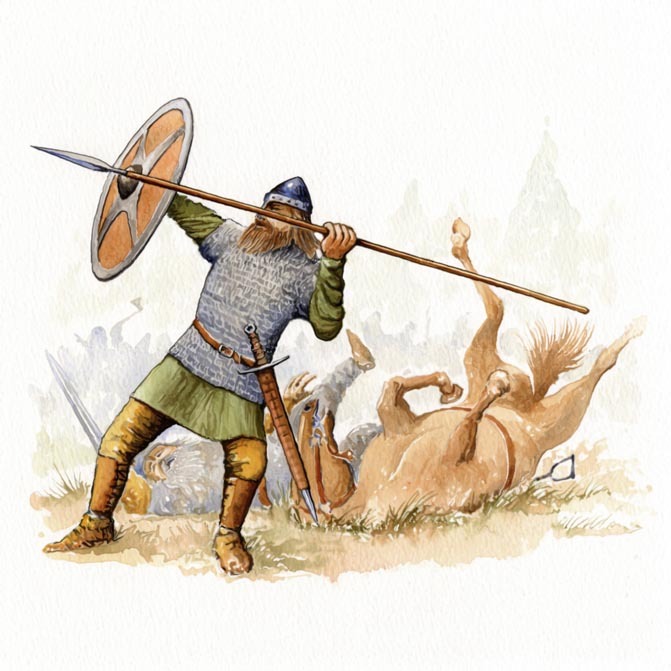 For seven hours he held this most important post, and though twice wounded and practically single-handed, he maintained his position until another section could be got to his help. On two occasions, with only two N.C.O.s, he got out on top under heavy machine gun and rifle fire, and cleared the enemy out of the trench, killing many. He continued to repel attack after attack until he was mortally wounded and collapsed. His valour, self-sacrifice and example were of the highest order." Edmund’s posthumous VC was presented to his widowed mother in a ceremony at Buckingham Palace in June 1919. As De Wind has no known grave, he is commemorated on the Pozières Memorial to the Missing. Although Richard Annesley West was born in Cheltenham, he was the son of Augustus George West of White Park, County Fermanagh, and his wife Sara, the daughter of Canon Richard Booth Eyre, a Church of Ireland rector in County Galway. 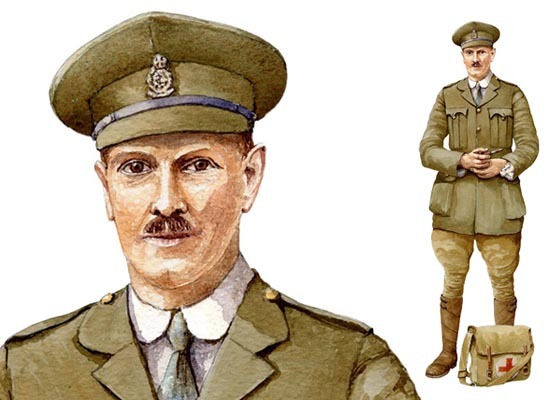 An incredibly brave man, West won four bravery awards during the course of 1917 and 1918: the DSO, the Military Cross, a bar to his DSO and the VC. 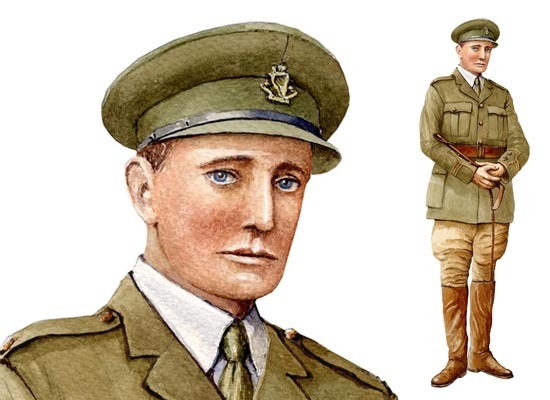 He was 39 years old, and an acting lieutenant-colonel in the North Irish Horse, to 6th Battalion, Tank Corps when he won the VC for acts of bravery on 21 August and 2 September 1918. 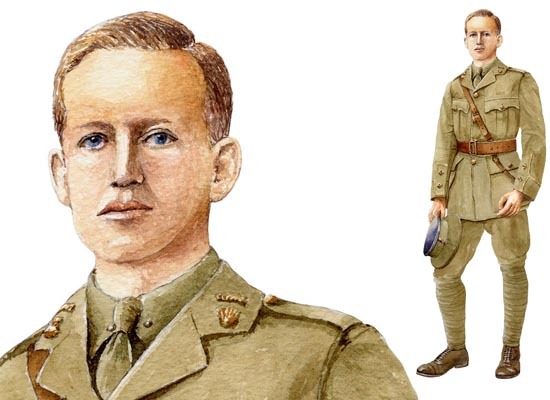 On 21 August 1918 at Courcelles in France, during an attack, the infantry lost their bearings in dense fog and Lieutenant-Colonel West at once collected any men he could find and led them to their objective,in face of heavy machine-gun fire. On 2 September at Vaulx-Vraucourt, he arrived at the front line when the enemy were delivering a local counter-attack. The infantry battalion had suffered heavy officer casualties and realizing the danger if they gave way, and despite the enemy being almost upon them, Colonel West rode up and down in face of certain death, encouraging the men. 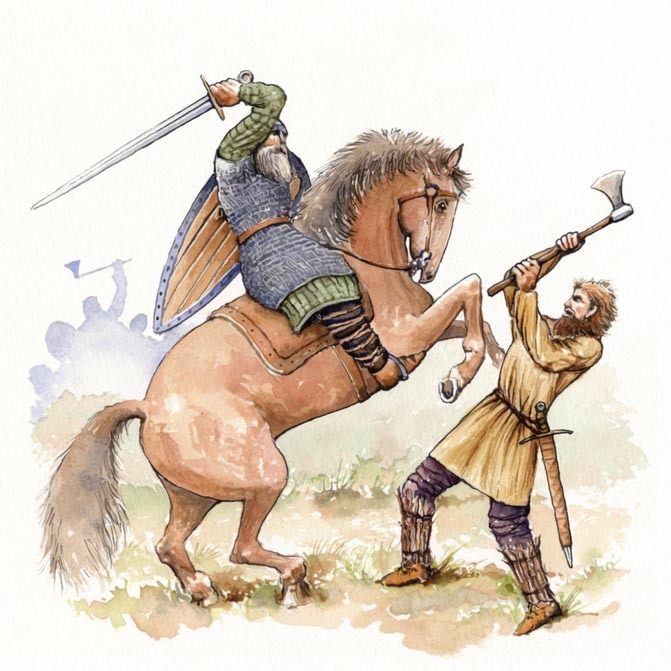 He told them: ‘Stick it men, show them fight, and for God’s sake put up a good fight.’ Those were probably his last words. He fell riddled with bullets. His magnificent bravery at a critical moment so inspired the infantry that the hostile attack was defeated. He is buried at the Mory Abbey Military Cemetery. His VC, DSO and Bar and Military Cross were presented to Maud Ethel West, his widow, in the ballroom of Buckingham Palace on 15 February 1919. Mrs West had given birth to their daughter, Gertrude Annesley West on 17 November 1918. Crichton was born in Carrickfergus, County Antrim, but grew up in the hamlet of Northrigg by Blackridge, West Lothian, Scotland. Before emigrating to New Zealand, he had served with the Cameron Highlanders during the Boer War. 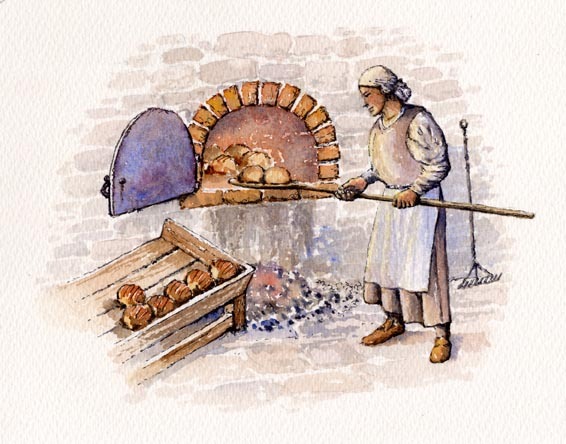 At the outbreak of the Great War, he enlisted in the New Zealand Expeditionary Force and served as a baker on the Western Front until May 1918. 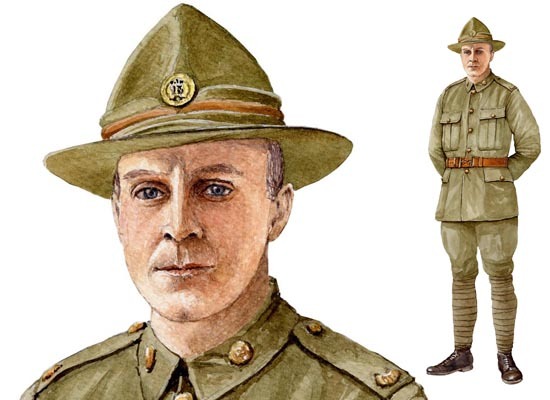 He then transferred to the 2nd Battalion, Auckland Infantry Regiment, and was awarded the VC for his deeds on 30 September 1918 at Crèvecoeur. The citation reads - "Private Crichton, although wounded in the foot, stayed with the advancing troops despite difficult canal and river obstacles. When his platoon was forced back by a counterattack he succeeded in carrying a message which involved swimming a river and crossing an area swept by machine-gun fire. Subsequently he rejoined his platoon and later undertook on his own initiative to save a bridge which had been mined. Under close fire he managed to remove the charges, returning with the fuses and detonators." Crichton later achieved the rank of sergeant. He died at Takapuna, New Zealand. Born William Thomson in College Square East in Belfast, into a family that claimed Scottish Covenanter ancestry he moved to Scotland in 1832 when his father was appointed Professor of Mathematics of Glasgow University. At a mere ten years of age Thomson became a student at this university, continuing his studies at Cambridge University. 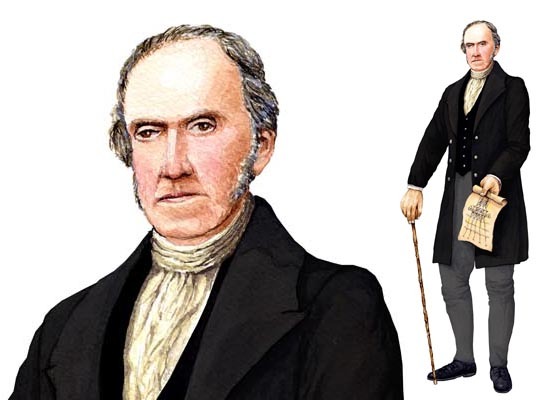 Aged only 22, he returned to Glasgow as Professor of Natural History at the age of 22, remaining in this position until his retirement 53 years later. 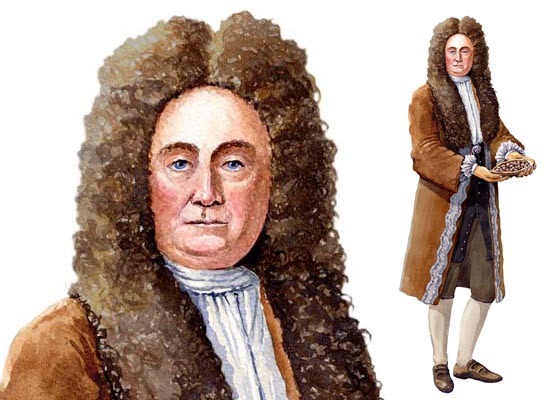 Thomson was regarded as one of the greatest scientists of his age. 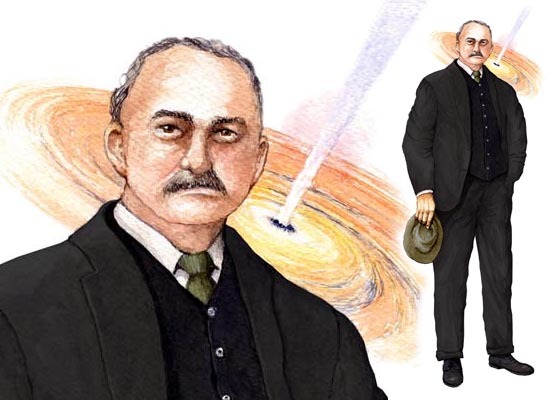 He pioneered advances in several areas of science, most notably in developing the laws of thermodynamics and his name is permanently commemorated in the unit of temperature named after him. 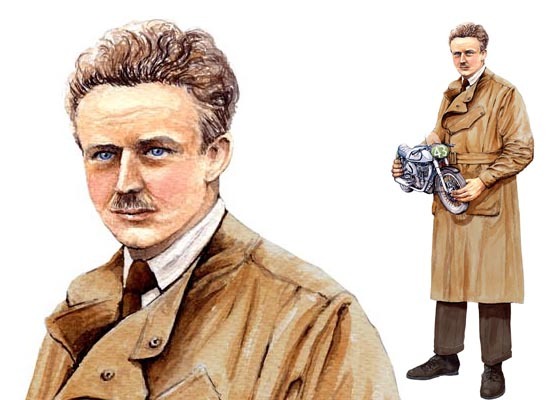 Among his many other endeavours, he made a significant contribution to submarine telegraphy and the successful laying of transatlantic communication cables. 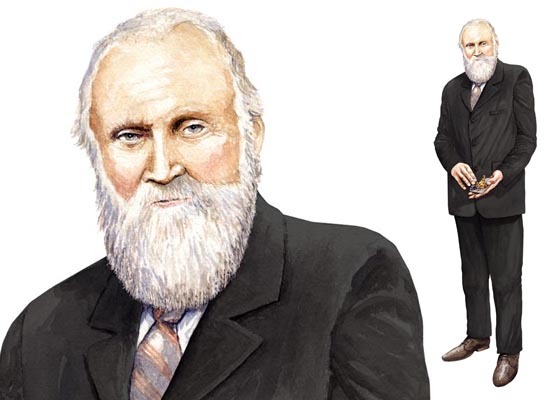 In 1866 he was knighted and in 1892 he was created Baron Kelvin of Largs. His statue stands near the Ulster Museum in Botanic Gardens in Belfast, while a blue plaque has been placed at his birthplace. 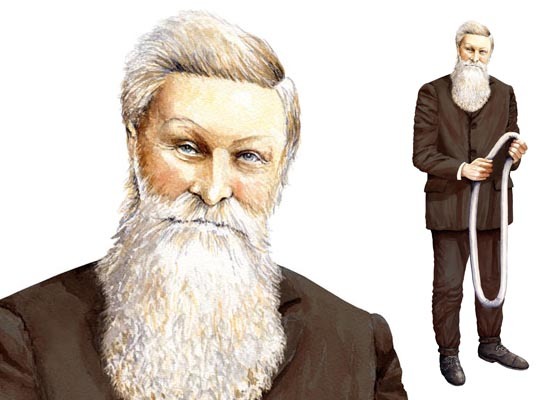 Born into a farming family near Dreghorn, Ayrshire, John Boyd Dunlop studied veterinary medicine in Edinburgh and, in 1867, having worked as a vet for a number of years in Edinburgh, moved to Belfast where he established a successful practice. In 1871, in Ballymena First Presbyterian Church, he married Margaret Stevenson, a farmer’s daughter. 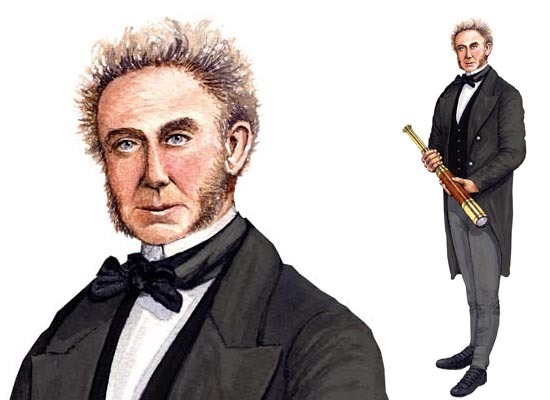 It was in 1887-88 that he devised an air-filled rubber tube that was fitted to his nine-year-old son’s tricycle. Existing tyres were made of solid rubber which made cycling uncomfortable on uneven surfaces. Dunlop’s experiments proved successful and the popularity of his pneumatic tyre really took off after a well-known cyclist won a series of races on a bicycle fitted with such tyres. A Dublin businessman, Harvey du Cros, seized on the commercial potential of the innovation and with Dunlop established the Pneumatic Tyre and Booth’s Cycle Agency, as the firm was originally known. Dunlop’s experiences with this company were not entirely happy and he resigned from its board in 1895. However, his name and image became very much part of the brand and today the name Dunlop is still instantly associated with tyres. Dunlop moved to Dublin in 1892 and died there in 1921. Harry Ferguson was born at Growell near Dromara in County Down. 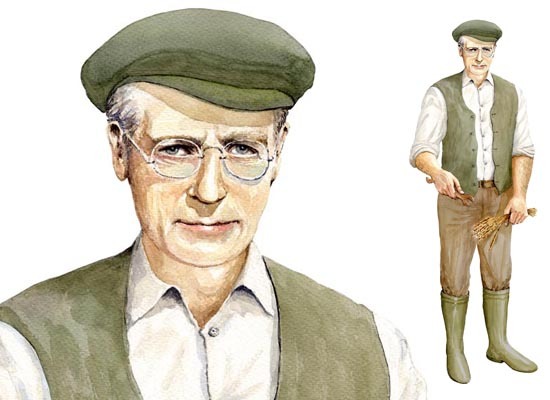 He revolutionised global agriculture through his development of the modern tractor, and built and flew the first aeroplane in Ireland. 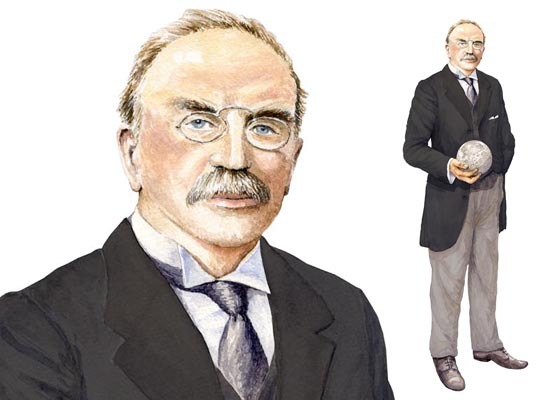 Harry Ferguson was arguably the greatest Ulster-Scots innovator of all time. 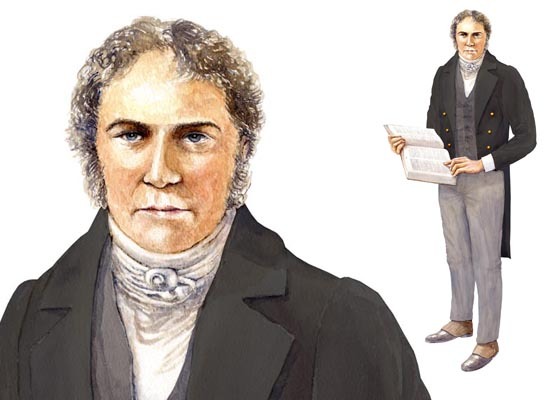 A natural inventor, he turned his attention to agriculture and came up with a new plough design which could be attached rigidly to a tractor, which he developed over time until it became the hydraulic three point linkage. His prototype ‘Ferguson Black’ is in the Science Museum in London. In the 1920s, just after the state of Northern Ireland was established, Ferguson advised the Prime Minister, Sir James Craig, that the new country needed a world-class event. The Ulster TT road race - the fastest in the World - was born and for decades it attracted the world’s top motorsport racing teams to Northern Ireland. A series of business agreements, first with the David Brown company in England, then with Henry Ford, and eventually with Massey-Harris, resulted in the establishment of one of the biggest brand names in global agriculture - ‘Massey Ferguson’, in 1953. Born on a farm at Magheragall, near Lisburn, close to the Presbyterian church which his family had belonged to for generations, Joseph Larmour moved with his family to Belfast as a young boy where his father ran a grocery business. 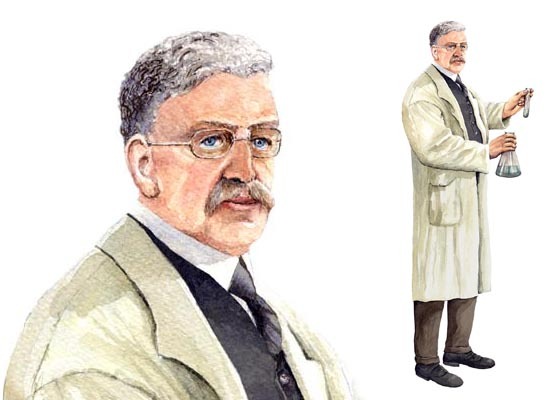 At Royal Belfast Academical Institution he excelled at mathematics and classics and, still only in his early teens, entered Queen’s College (now University), Belfast, receiving his BA at the age of 17 in 1874 and his MA a year later. In 1877 he began further studies at St John’s College, Cambridge, graduating in 1880. In the same year he was appointed Professor of Natural Philosophy at Queen’s College, Galway. In 1885 Larmor returned to Cambridge to take up a lecturing position, and in 1903 was appointed Lucasian Professor of Mathematics. He published widely on applied mathematics and theoretical physics, his most important study being ‘A dynamical theory of the electric and luminiferous medium’, originally published in the Philosophical Transactions of the Royal Society and later as Aether and matter (1900). He also wrote a biography of Lord Kelvin. He was knighted in 1909 and two years later was elected MP for Cambridge. A crater on the moon is named in honour of Larmor. Robert Adrian was born in Carrickfergus County Antrim in 1775, the eldest of five children of a schoolmaster. Orphaned at the age of 15, he became a teacher and then a private tutor. While he himself had received a good education, he was self taught in advanced mathematics. In the 1790s he became involved with the United Irishmen and in the 1798 Rebellion fought at the Battle of Saintfield where he was severely wounded. Afterwards he escaped to America with his wife and infant daughter. 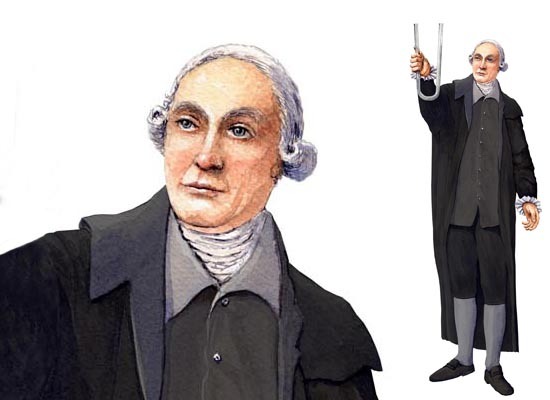 In America he continued to teach and was employed in a succession of academic institutions such as Princeton in New Jersey and others in , New York and Pennsylvania. He was vice-president of the University of Pennsylvania in 1828. 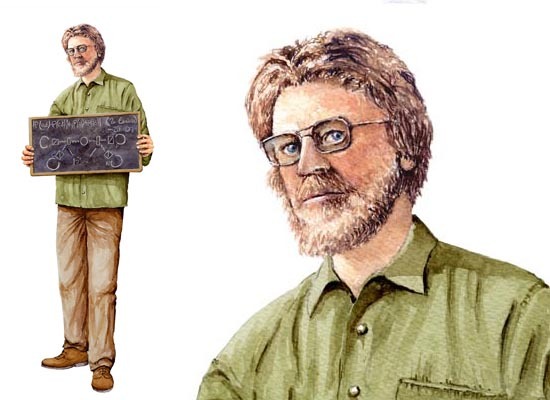 During his teaching career he published widely and became one of the most influential mathematicians in the United States. His most significant work, published in 1809, described a method for reducing errors in observation. Unfortunately, his scientific papers are believed to have been lost after the historian researching them died in 1945. 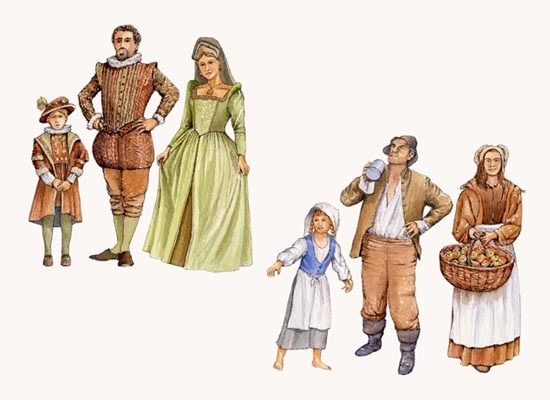 Born at Killinchy in the Woods, near Crossgar, County Down, James Martin was the son of Thomas Martin, a farmer and inventor, and his wife Sarah (nee Coulter). He gained experience in engineering in Belfast before moving to England as a young man. 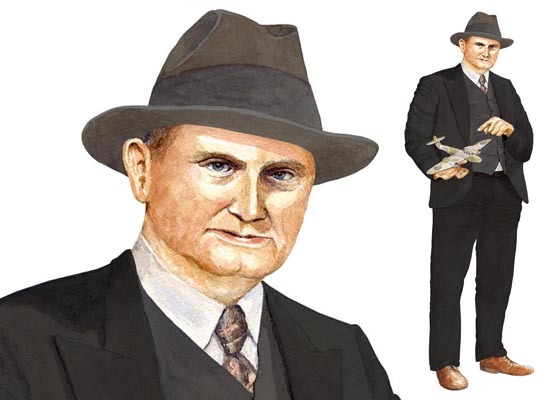 In 1929 he formed the Martin Aircraft Company which was based at Denham in Buckinghamshire. This was renamed the Martin-Baker Aircraft Company in 1934 after Capt. Valentine Baker joined him as a partner. During the Second World War, the company supplied the RAF with a number of accessories and also experimented with aircrew safety devices. This led to a commission to produce an explosively-charged aircraft ejector seat. The first live demonstration took place on 24 July 1946 when a brave volunteer was ejected from 8,000 feet and landed safely. The following year the ejector seat went into general production and in Martin’s lifetime it was believed that the device had saved the lives of nearly 5,000 aircrew. Martin remained active in the company well into old age. Among his many honours were a knighthood in 1965 and an honorary doctorate from Queen’s University, Belfast in 1969. In the spring of 1791, William Ritchie, a shipbuilder with a yard at Saltcoats in Ayrshire, visited Belfast and quickly recognised its potential as a centre of shipbuilding. 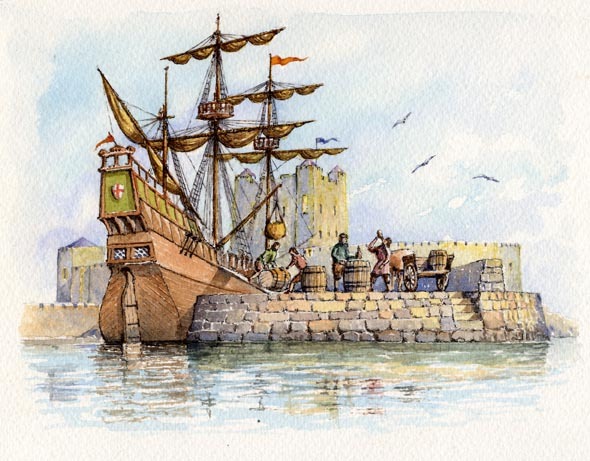 He returned at the beginning of July with skilled workmen and materials and established a shipyard in partnership with his younger brother Hugh. 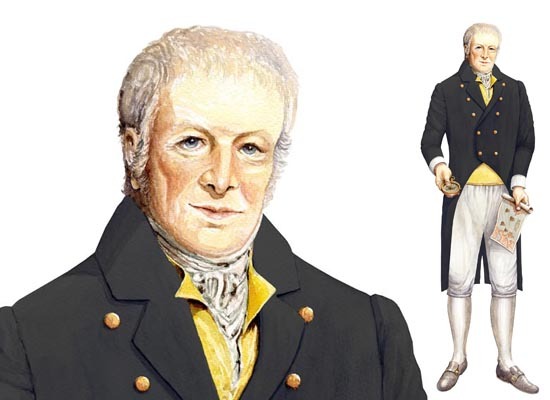 While ships had been built in Belfast before this, William Ritchie is regarded as the man who founded the modern shipbuilding industry in the town. Today the site of his original shipyard is occupied by the offices of the Belfast Harbour Commissioners. His first ship, the Hibernia, was launched in July 1792 and sailed to New York on her maiden voyage. The business expanded providing considerable local employment. By 1811 over 30 vessels of at least 50 tons had been completed – the average size of a Ritchie-built ship was 220 tons. William Ritchie retired in 1828 and died in January 1834; he was buried in the New Burying Ground, Clifton Street. He was an active member of Second Presbyterian Church, Belfast, and generously supported various charitable, scientific and literary organisations. Another brother, John, also became a shipbuilder in Belfast. Born in Ballymena, where his father Alexander was a successful woollen draper, Edward Robinson went into business with John Cleaver in 1870, establishing the firm of Robinson and Cleaver. Initially based in premises in Castle Place, the firm quickly achieved an excellent reputation for the quality of the goods it supplied, especially Irish linens, and in 1878 Queen Victoria herself placed an order for various articles. As the firm expanded through providing mail order facilities, so its fame spread worldwide. The business having moved to High Street in 1879, in 1886 plans were approved for a new commercial premises at the junction of Donegall Square North and Donegall Place. One of Belfast’s architectural jewels, the new building, designed by the famous firm of Young and Mackenzie, was opened in 1888. Robinson was active in public life in Belfast, serving as a justice of the peace and an alderman of the city. He was also known as a connoisseur and collector of fine art. He retired as chairman of Robinson and Cleaver in November 1905, just a few months before his death in March 1906 at his home at Lismara (now Abbeydene), Whiteabbey. The son of a Methodist minister, Ernest Thomas Sinton Walton was born in County Waterford in 1903. 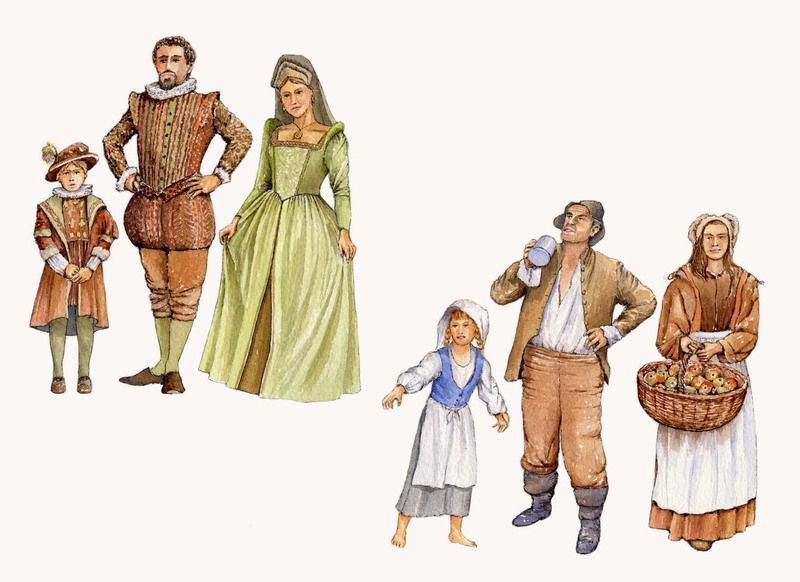 His mother’s family, the Sintons, were from Richhill in County Armagh and believed to have descended from an ancestor who moved there from Scotland at the end of the 1600s. He received his secondary education at number of schools, including Methodist College, Belfast, before going on to Trinity College, Dublin, where he graduated with a double first and a large gold medal in experimental science. After completing a Master’s degree at Trinity, he moved to England as a research student at Trinity College, Cambridge, under the brilliant Ernest Rutherford, where he was awarded his doctorate in 1931. In 1934 he returned to the physics department in Trinity College, Dublin, being appointed Erasmus Smith Professor of Natural and Experimental Philosophy. He was regarded as an exceptionally gifted teacher. 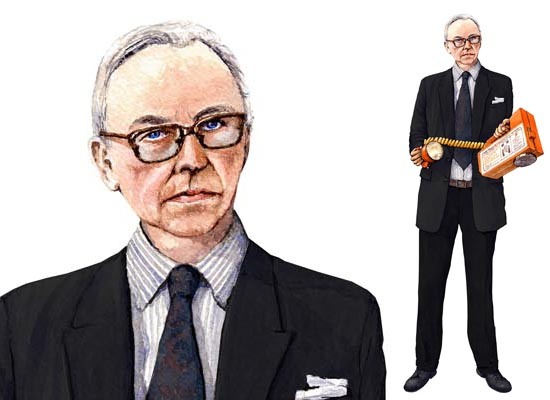 Walton is best remembered for his research into nuclear physics while at Cambridge. In 1951 he and his former colleague, John Cockcroft, were awarded the Nobel prize for physics ‘for their pioneer work on the transmutation of atomic nuclei by artificially accelerated atomic particles’. Walton retired in 1974 and moved to Belfast where he died in 1995. 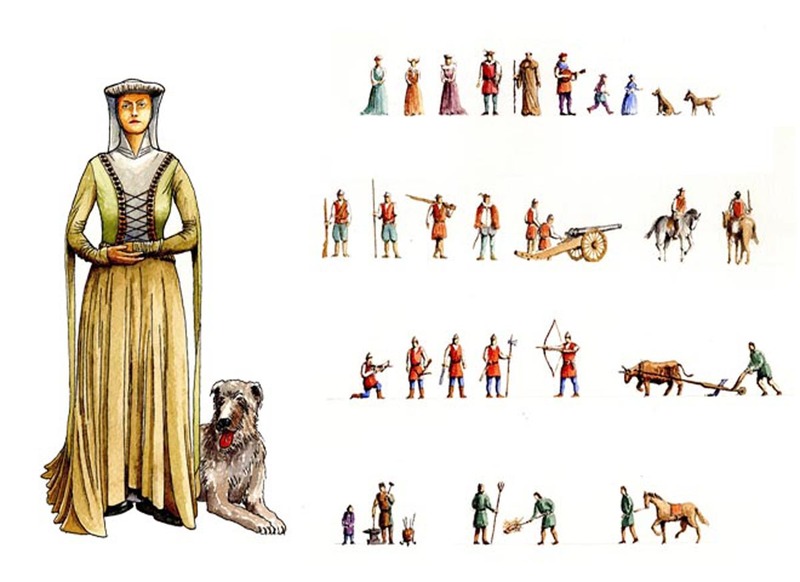 Lilian Bland was born in Maidstone, Kent, she came from a family with strong Ulster connections. Her grandfather, Robert Wintringham Bland, was a Church of Ireland clergyman who served several parishes in and around Belfast. By 1901 she was back in Ulster, living with her father, John Humphry Bland, and widowed aunt, Sarah Maria Smythe, in Tobarcooran House, Carnmoney, County Antrim. A keen photographer, Lilian became fascinated by the mechanics of flight while photographing birds in the Scottish Highlands. 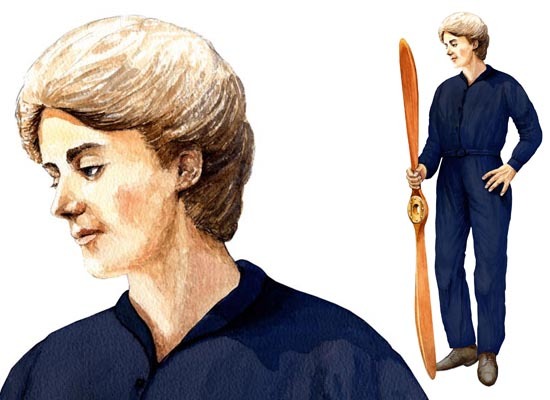 She was also inspired by the early pioneers of aviation and in 1909 decided to build her own plane. This aircraft, a biplane glider which she named ‘Mayfly’, was constructed in the workshop at her home and test flights on Carnmoney Hill were successful. Afterwards it was fitted with an engine and during experiments at Randalstown was able to rise to 30 feet above the ground. Lilian’s father was concerned for her safety and persuaded her to give up her involvement in aviation in return for a Model T Ford car. 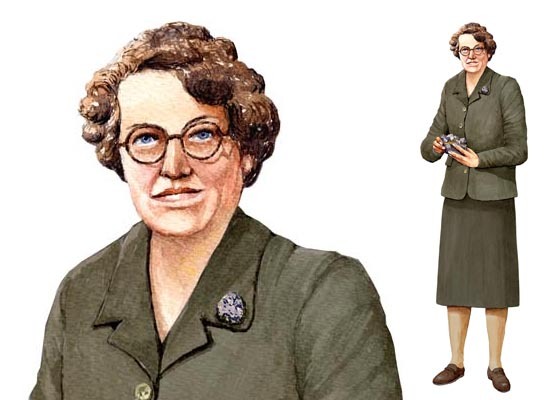 In October 1911 she married her cousin and emigrated to Canada, though later returned to England and lived in Cornwall. 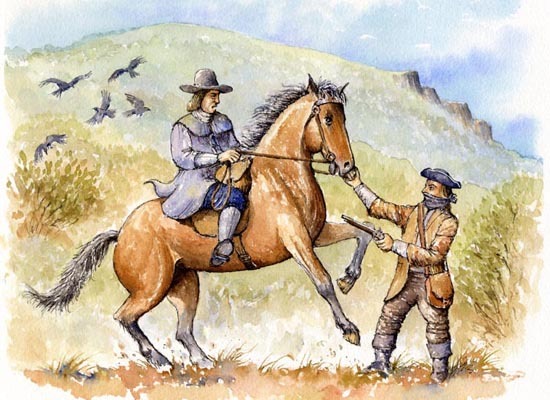 Naoise O'Haughan (Irish: Naoise Ó hEocháin), also known as Neesy, Ness and Nessie (1691–1720) was a highwayman in County Antrim, Ireland in the late 17th and early 18th centuries. The wild rolling hills of Antrim - Divis and Black Mountain - provided an ideal environment for O'Haughan. He is said to have hidden in caves at the Hatchet Field on the Black Mountain West of Belfast, before he was captured and hanged at 'The Three Sisters', the gallows green, near Carrickfergus Castle in 1720. 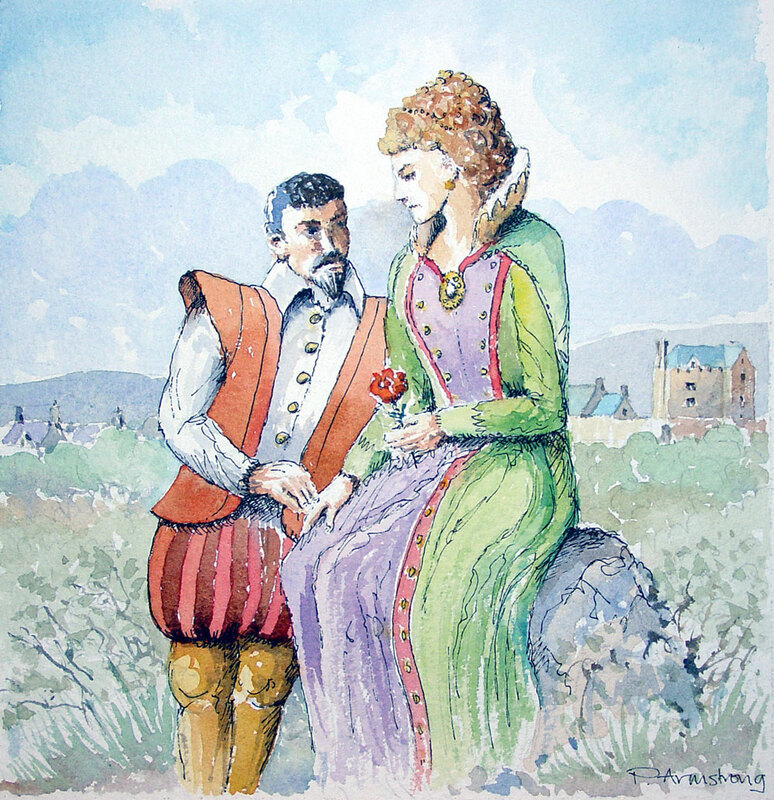 During the plantation of Ulster, Sir John Hume from Berwickshire built a castle at Tully by 1613 on lands acquired by the Maguires. The life of the castle was brief. Sir John Hume died in 1639 and was succeeded by his son, Sir George. 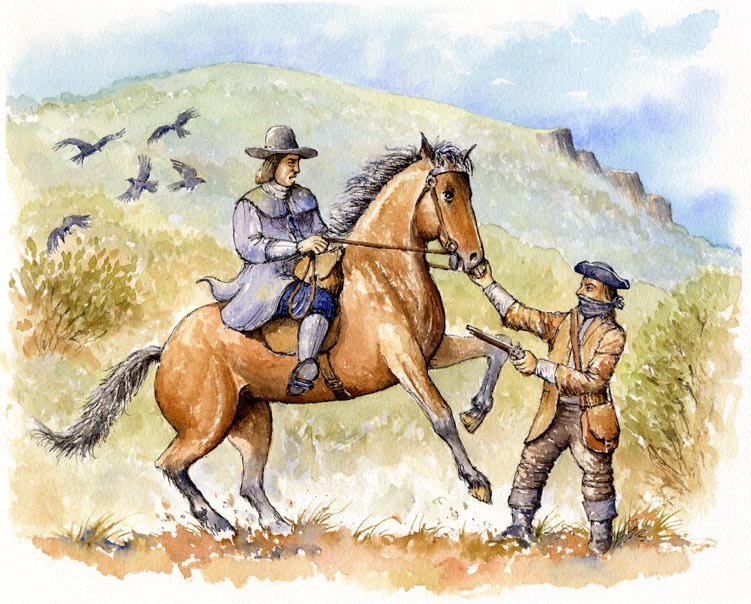 In 1641, Rory Maguire set out to recapture his family’s lands. On arrival only women and children were in the castle and despite assurances that they would be spared the Maguires killed 60 women and children and 15 men, sparing only the Humes. The castle was burnt and the Humes never returned. 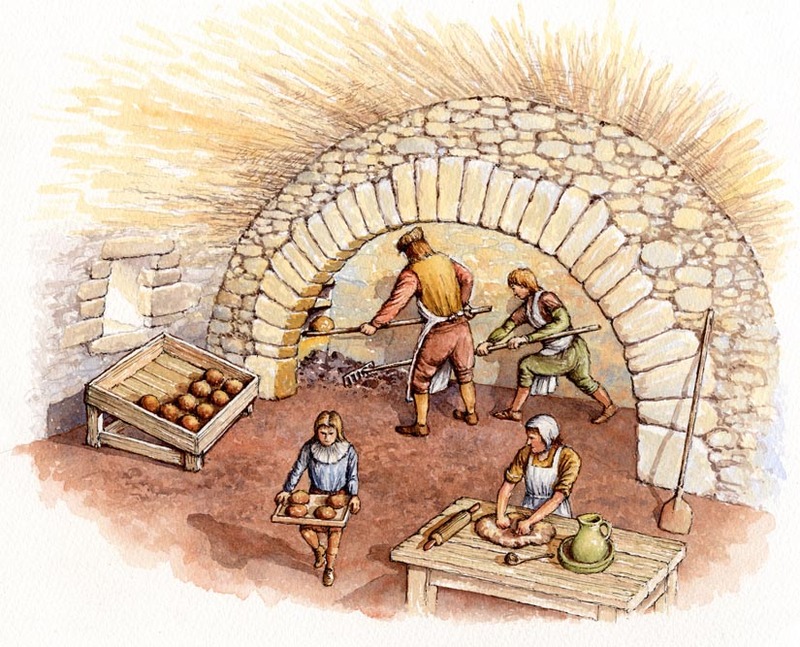 This view shows the large fireplace on the ground floor with a small oven probably used for baking bread. 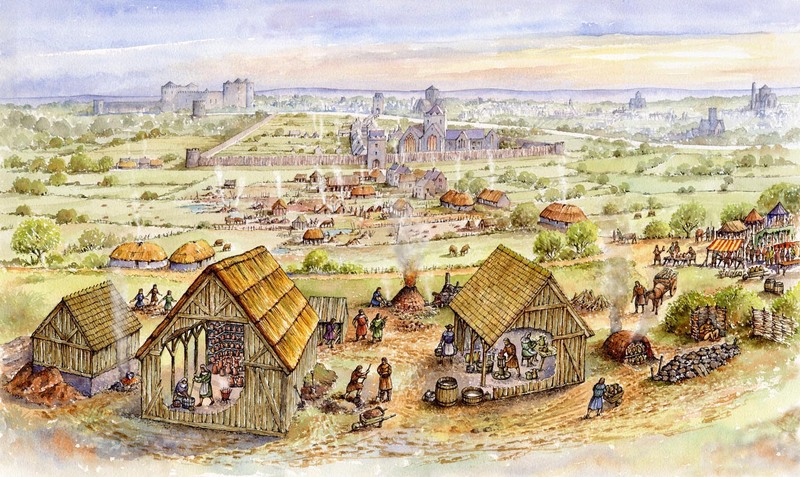 Excavations by Kilkenny Archaeology in 2006 revealed a previously undocumented extra-mural suburban settlement that included a pottery kiln and a range of buildings and features that made up a production unit. 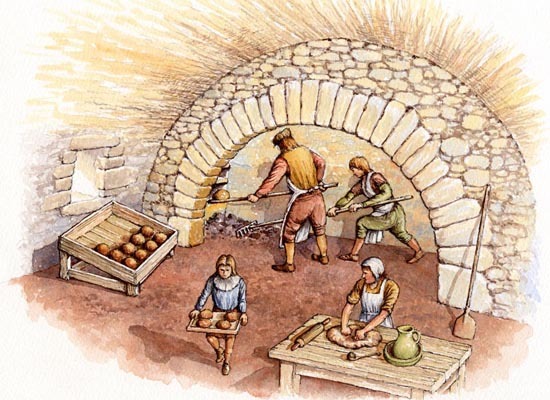 Throughout Europe it has been usually solely the kilns that have been excavated and Highhays is one of the rare examples of a near-complete complex. 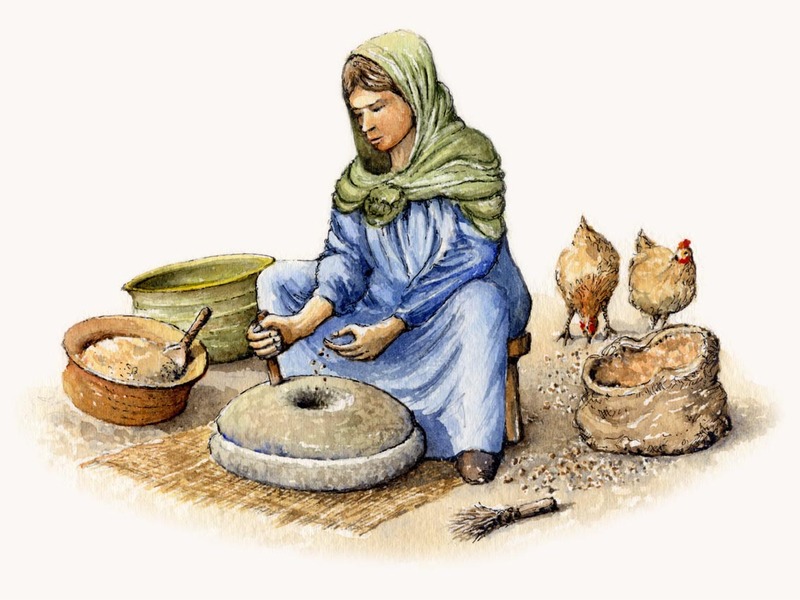 The outcomes from a range of scientific and specialist analyses that were brought to bear on the excavated material makes it a site of some considerable importance for the study of the technology, marketing and social context of the medieval ceramics industry. 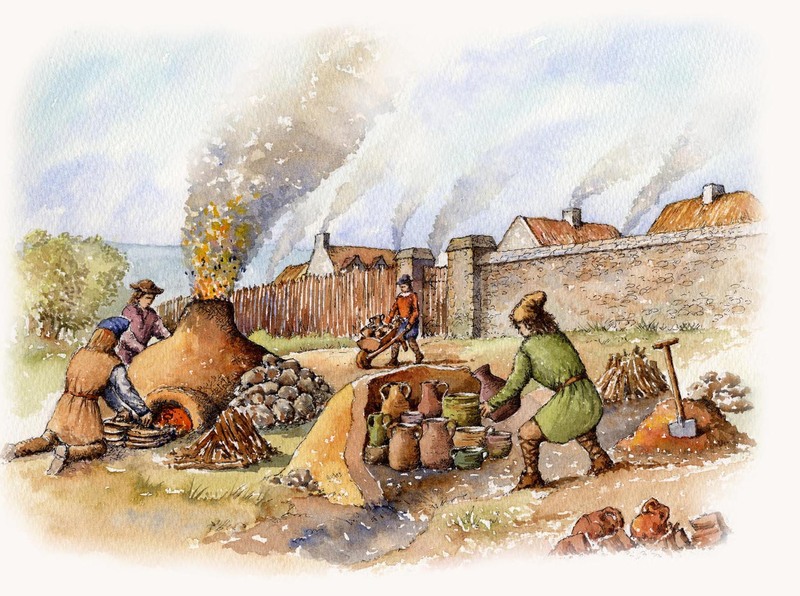 The extent of the excavations also facilitated an examination of the wider context of the pottery and demonstrated that it was set within an industrial suburb that had been established on the town commons. 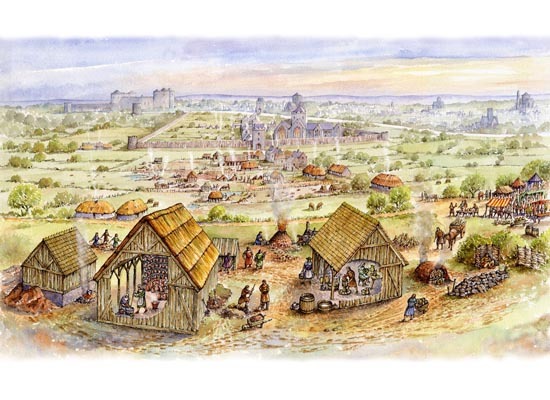 This is also one of the few excavations to have taken place in an Irish suburb and it provides a considerable body of new information on how these areas were constituted and used, as well as their origins and the timing of their decline. 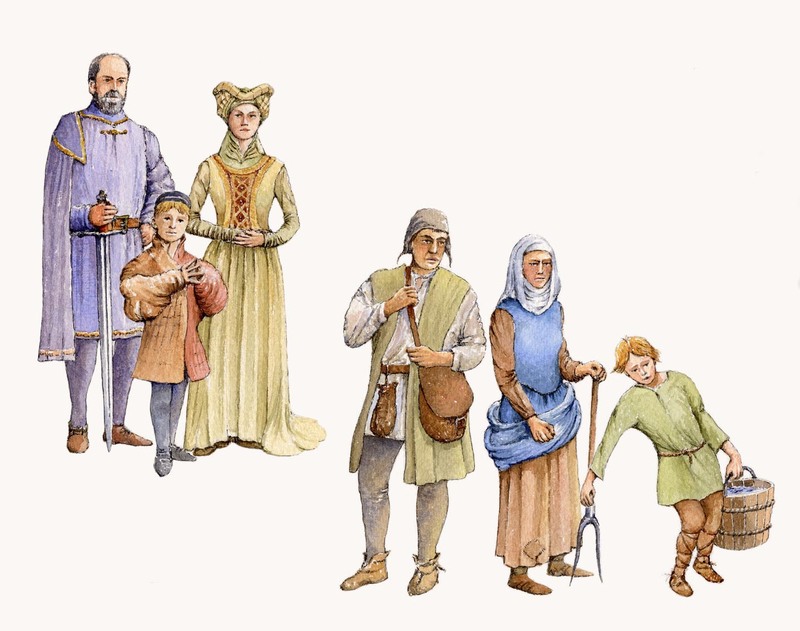 This was one of a number of illustrations I prepared to assist in explaining finds displayed at Carrickfergus's local museum. 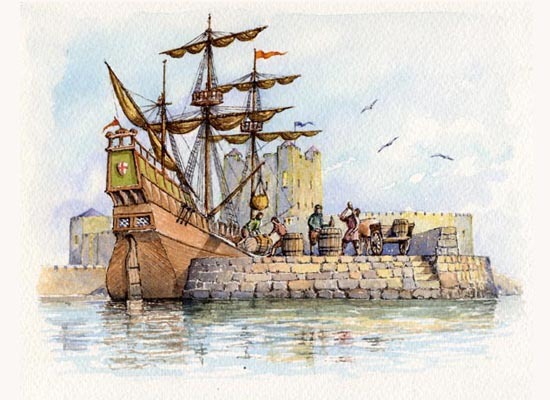 Having spent my school days at Carrickfergus I have very fond memories of the town which, as well as having one of the best preserved Norman castles and the most complete post medieval town walls in Ireland, has an extremely rich trove of excavated finds and artefacts. 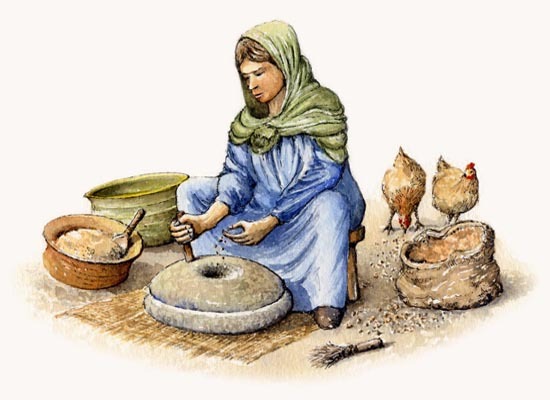 This image shows how a rotary quern was used to grind grain. 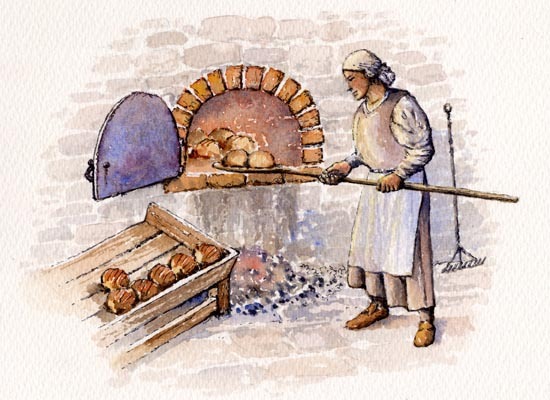 This image shows how a bread oven was used. 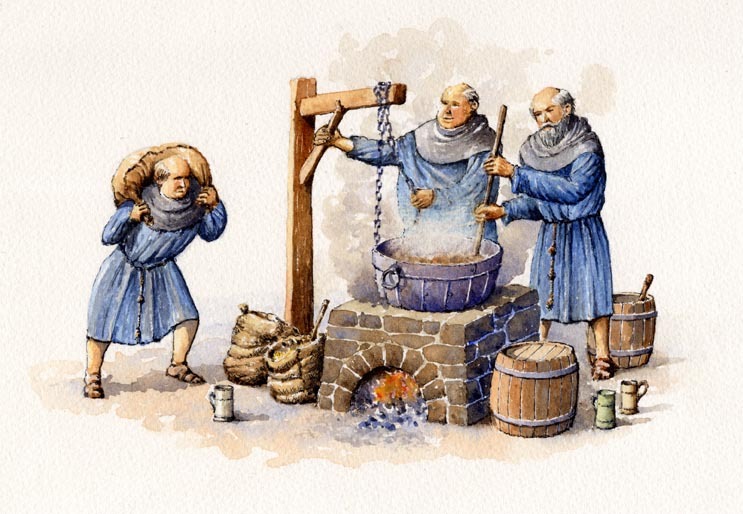 This image shows the process of early ale making. 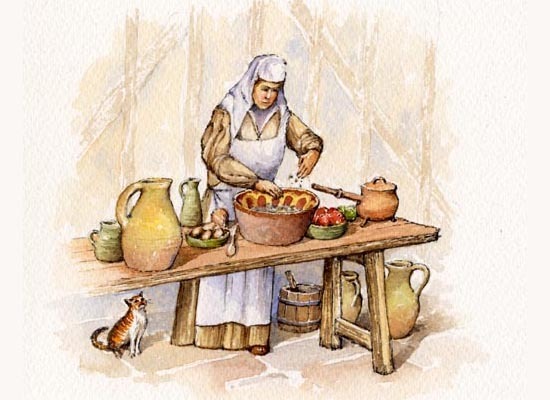 This image shows how the finds were used for cooking. 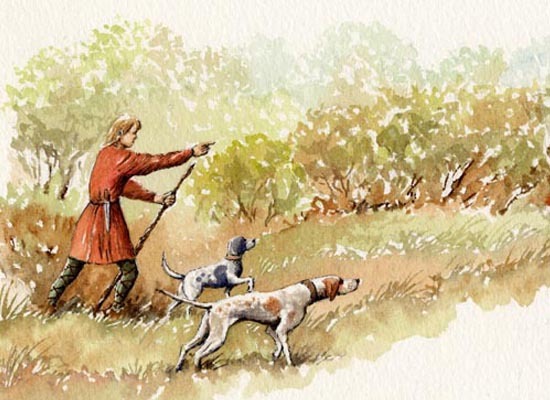 This image shows how dogs were used in hunting. 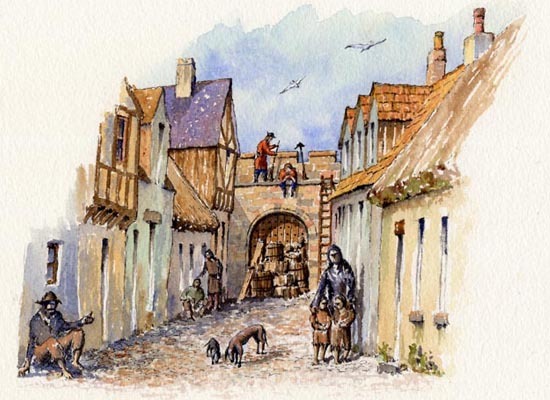 This image shows North Street during one of the sieges when any dogs were viewed with hungry eyes. 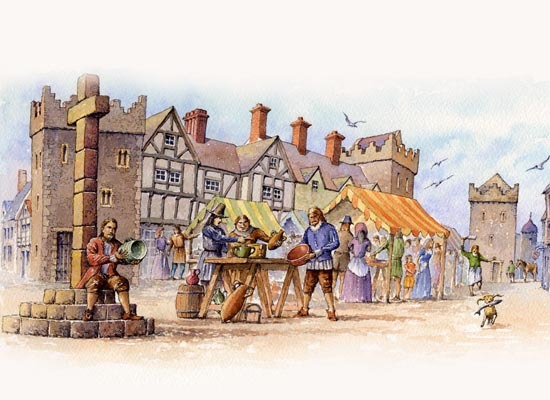 This image shows where most of the vibrant trade entered the town. 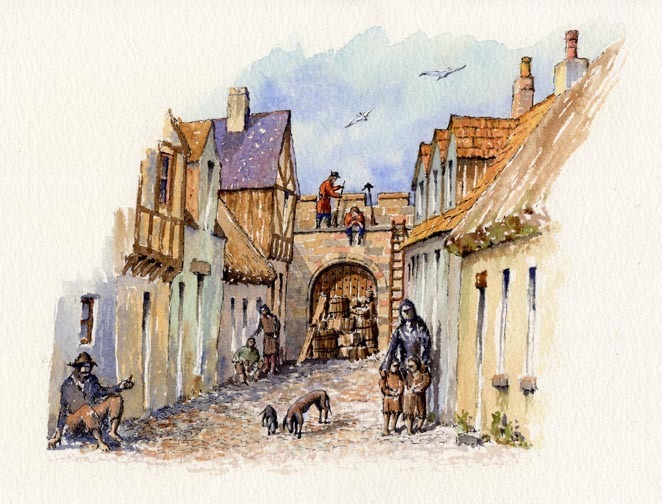 This image shows the Main Street/Market Street area where much of the vibrant trade was carried out. St Nicholas' Church is shown on the left as a cruciform building and the Friary is on the right. Sir Arthur Chichester's house was built on the latter site. The castle is still identifiable and it was around this time that extensive modifications were being made, especially on th eouter ward. 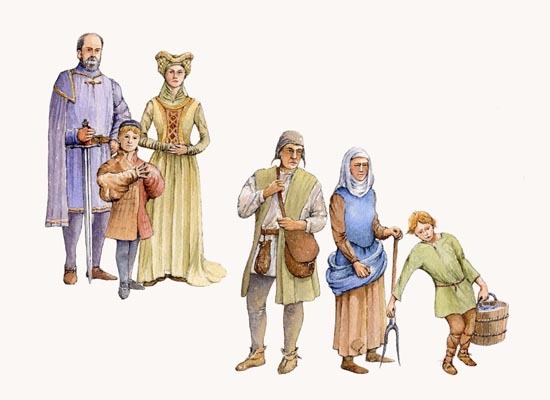 This image shows how both the nobility and peasantry would have dressed during the post medieval period. 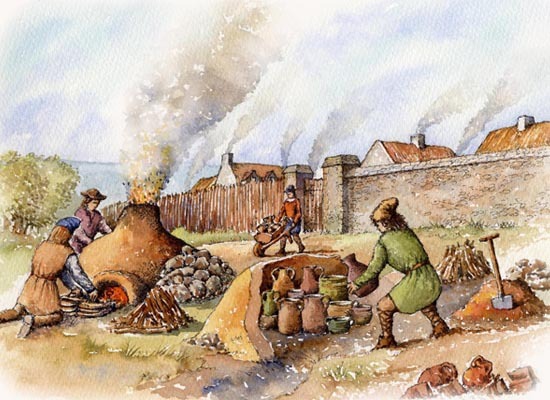 The pottery kilns were placed outside the town walls due to their fire risk. This image shows an actual site found just outside the West Gate. 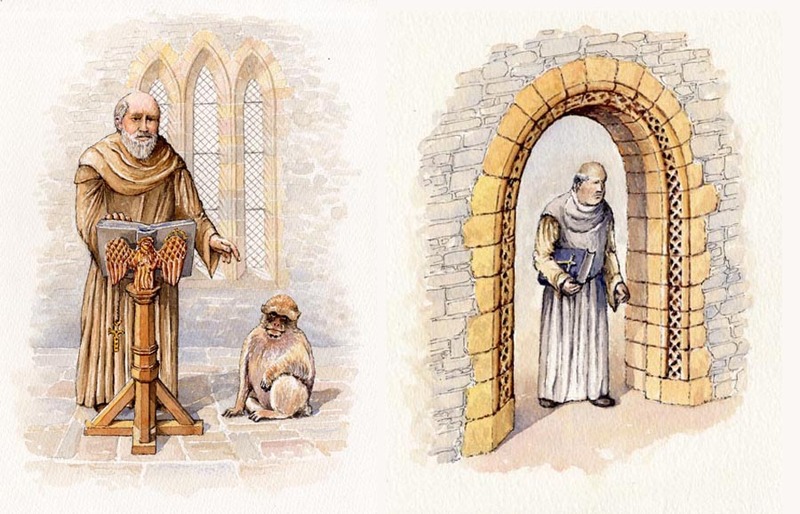 These images show an explanation for the Barbary Ape remains that were found and also a possible location of a carved stone from an early abbey. 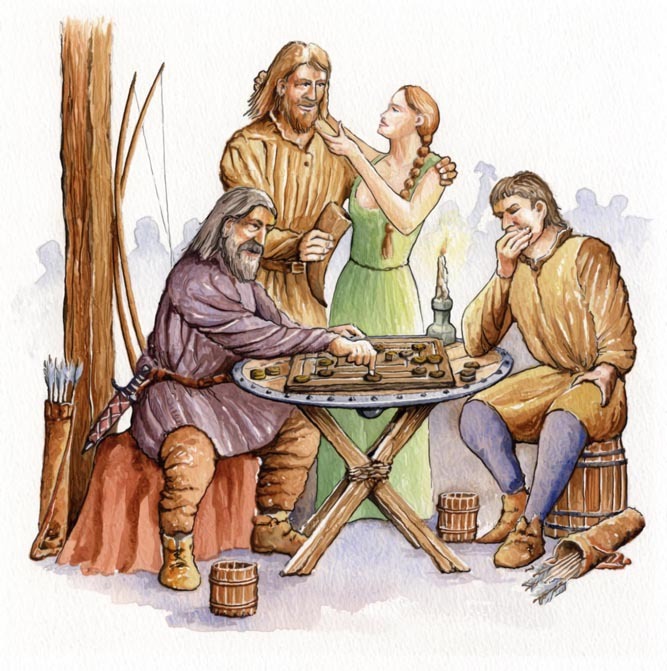 This was one of a number of illustrations I painted for the Vestfold Museum in Tønsberg, Norway. 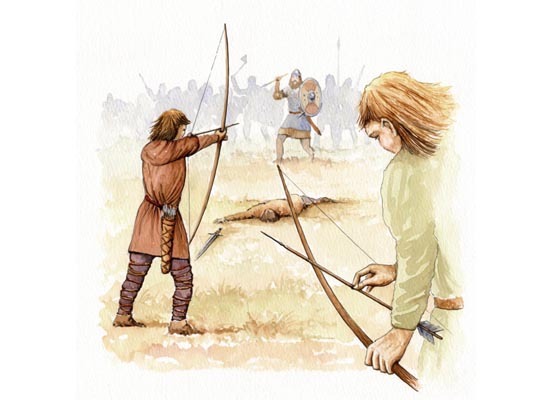 The exhibition was to describe a turbulent period in Norway's history in the late 12th and early 13th centuries, during the rebellion of the Birkebeiners (or Birch Legs) against King Sverre. The panels were to help show the combat techniques and various weaponry used along with those periods the warriors spent unwinding. 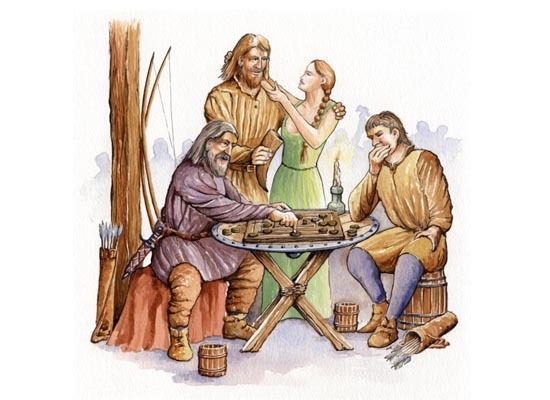 Here they are playing a game similar to backgammon called Nina Mens Morris. Note the Birkebeiner with his birch boots! 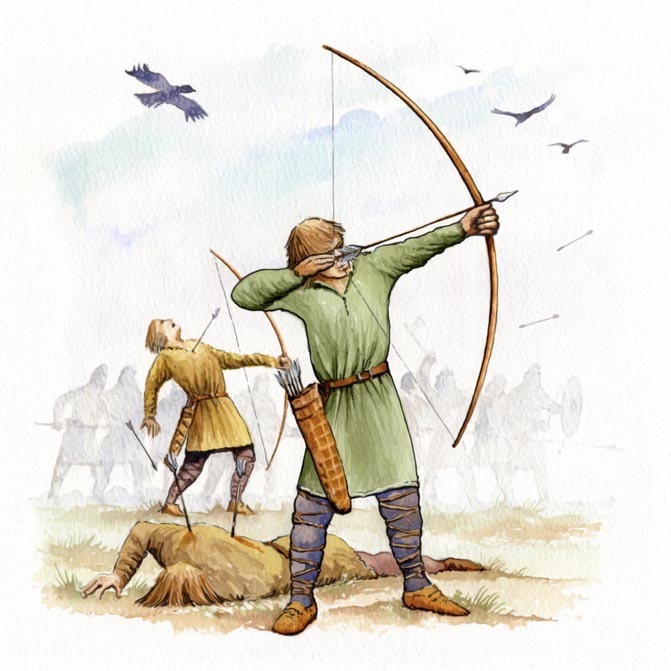 Spears could be thrown or thrust but either way it was a lethal tool. 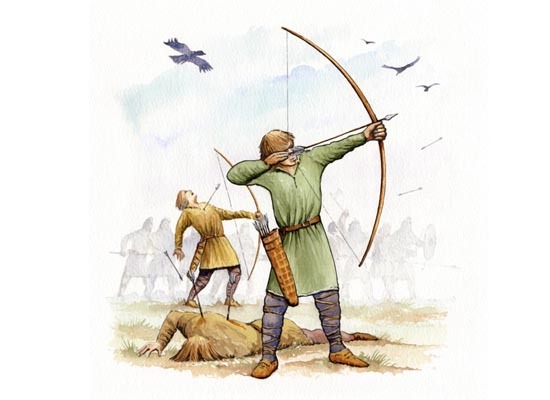 This image shows the long thin armour piercing arrowhead for penetrating chain mail. This was one of two large panels I painted for the Vestfold Museum in Tønsberg, Norway. 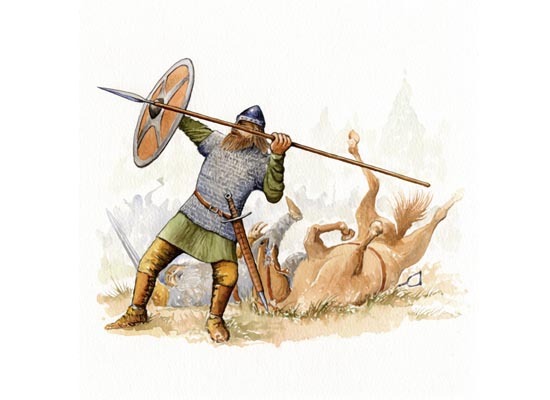 It shows a crucial battle fought in the late 12th century, during the rebellion of the Birkebeiners (or Birch Legs) against King Sverre. 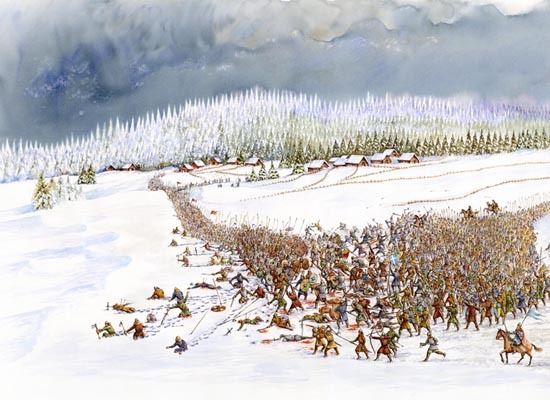 The Birkebeiners (so called because they tied birch twigs around their ankles) had the greater numbers but whilst attacking Sverres army they were impeded by deep snow and were effectively caught in a bottleneck. 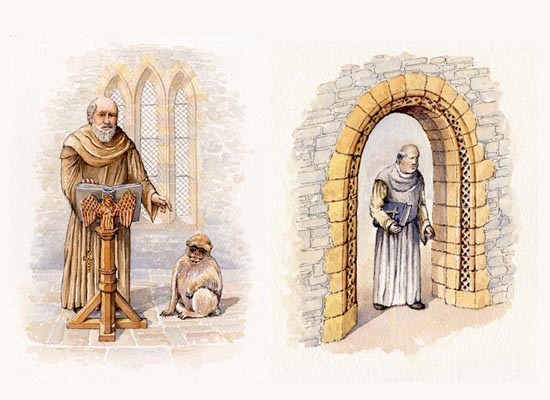 The state-of-the-art exhibition shows animated sequences describing the history of North Antrim and as well as the reconstruction illustrations of Clogh Castle these figures were also used. 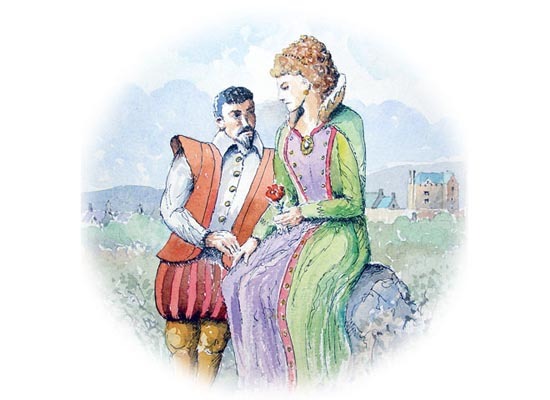 Sir Nicholas Bagenal - who built the castle - had a daughter Mabel, who married Hugh O'Neill but the power struggle in Ulster at the time meant that this was not a happy marriage.